A tissue adhesives and sealant formed by reacting a polyglycerol aldehyde with a water-dispersible, multi-arm amine is described. The tissue adhesive and sealant may be useful for medical and veterinary applications, including, but not limited to, wound closure, supplementing or replacing sutures or staples in internal surgical procedures such as intestinal anastomosis and vascular anastomosis, tissue repair, preventing leakage of fluids such as blood, bile, gastrointestinal fluid and cerebrospinal fluid, ophthalmic procedures, drug delivery, and to prevent post-surgical adhesions. 本专利申请根据35 USC § 119，要求美国临时申请序列号61/164005、 61/164007和61/164012的优先权，所有文献均提交于2009年3月27日。  The present patent application according to § 119 35 USC, US Provisional Application Serial No. 61/164005, 61/164007 and 61/164012 priority, and all documents were filed March 27, 2009. 本发明涉及医用粘合剂和密封剂领域。  The present invention relates to the field of medical adhesives and sealants. 更具体地讲，本发明涉及由聚甘油醛与水分散性多臂胺反应所形成的组织粘合剂和密封剂。 More particularly, the present invention relates to tissue adhesives and sealants by the reaction of a polyamine with glyceraldehyde water-dispersible multi-arm is formed. 组织粘合剂和密封剂具有许多潜在的医学应用，包括闭合伤口、补充或替代体内手术操作中的缝合线或卡钉、防止流体如血液、胆汁、胃肠液和脑脊液渗漏、将合成的覆盖物或镶嵌物粘连到角膜上、药物递送装置、以及作为防止术后粘连的防粘阻隔物。  tissue adhesives and sealants have many potential medical applications, including wound closure, complementary or alternative in vivo surgical procedure of sutures or staples, to prevent a fluid such as blood, bile, gastrointestinal fluid and cerebrospinal fluid leakage, synthetic covering or inlay adhered to the cornea, the drug delivery device, and a release preventing postoperative adhesion barrier. 常规的组织粘合剂和密封剂一般不适用于广泛的粘合剂应用领域。 Conventional tissue adhesives and sealants are generally not suitable for a wide range of adhesive applications. 例如，氰基丙烯酸酯基的粘合剂已被用于局部伤口闭合，但是有毒降解产物的释放则限制了体内应用中的用途。 For example, cyanoacrylate-based adhesives have been used for topical wound closure, but the release of toxic degradation products limits the use of in vivo applications. 纤维蛋白基的粘合剂固化缓慢，具有差的机械强度，并且具有病毒感染的风险。 Fibrin curing adhesive slow group, have poor mechanical strength, and has a risk of viral infection. 此外，纤维蛋白基的粘合剂不与下层组织共价键合。 Additionally, fibrin adhesives group does not covalently bonded to the underlying tissue. 已研发了若干类型的水凝胶组织粘合剂，它们具有改善的粘合性和胶粘性，并且是无毒的（参见例如khl等人的美国专利申请公布2003/0119985，和Goldmarm的美国专利申请公布2005/000289¾。这些水凝胶一般通过使具有亲核基团的组分与具有亲电基团的组分反应而形成，所述亲电基团能够与所述第一组分的亲核基团反应，经由共价键合形成交联网络。然而，这些水凝胶通常溶胀，过快溶解掉，或者缺乏足够的粘合性或机械强度， 从而降低了它们作为外科手术用粘合剂的功效。  have been developed several types of hydrogel tissue adhesives, which have improved adhesion and tackiness, and are non-toxic (see, e.g., U.S. Patent Application Publication 2003/0119985 khl et al., And Goldmarm U.S. Patent application publication 2005 / 000289¾. these hydrogels typically formed by reacting components having a nucleophilic group having components of the reaction of electrophilic groups, the electrophilic groups capable of with the first nucleophilic groups of reaction components, via a covalent bond to form a crosslinked network. However, generally these hydrogels swelled too quickly dissolve away, or lack sufficient adhesion or mechanical strength, thereby reducing their use as surgical efficacy of surgical adhesive. Kodokian等人（共同未决和共同拥有的美国专利申请公布2006/0078536)描述了由氧化多糖与水分散性多臂聚醚胺反应生成的水凝胶组织粘合剂。  Kodokian et al., (Copending and commonly owned U.S. Patent Application Publication 2006/0078536) describes a hydrogel tissue adhesive from the oxidized polysaccharide with a water-dispersible multi-arm polyether amine generated by the reaction. 这些粘合剂提供了改善的粘合性和胶粘性，在体温下易于交联，能够保持初始外形稳定性，不快速降解，并且对细胞无毒而不致使组织发炎。 The adhesive provides improved adhesion and tackiness, and easily crosslinked at body temperature, it is possible to maintain the initial shape stability, is not rapidly degraded, without causing toxic to cells and tissue inflammation. 然而，氧化多糖在水溶液中的不稳定性限制了它们用于商业应用的储存寿命。 However, the instability of oxidized polysaccharide in an aqueous solution which limits the shelf life for commercial applications. 例如，葡聚糖醛经历比其母体聚合物葡聚糖快得多的水解解聚（E. Schacht 等人，“J. Controlled Release”，1 :33_46，1984 ;Callant 等人，“Reactive Polymers", 8 ： 129-136，1988)。 For example, dextran aldehyde undergoes depolymerization hydrolysis than the parent polymer dextran much faster (E. Schacht et al., "J Controlled Release. ", 1: 33_46,1984; Callant et al., "Reactive Polymers" , 8: 129-136,1988). 因此，存在对组织粘合剂和密封剂的需要，所述组织粘合剂和密封剂具有由Kodokian等人所述（同上）的适宜水凝胶组织粘合剂特性，但是使用包含醛基的聚合物形成，所述聚合物在水溶液中比氧化多糖更稳定。  Accordingly, a need exists for tissue adhesives and sealants, tissue adhesives and sealants, a suitable hydrogel tissue adhesive having a characteristic Kodokian et al (supra), but containing aldehyde polymer is formed, the polymer in aqueous solution is more stable than the oxidized polysaccharide. 还存在对包含聚合物的组织粘合剂和密封剂的需要，所述聚合物包含醛基，并且在水溶液中比氧化多糖更稳定，并且具有比用氧化多糖制备的相当的制剂的那些类似的或更好的粘合强度。 There is also a need for tissue adhesives and sealants comprising a polymer, said polymer comprising aldehyde groups, and more stable than aqueous oxidized polysaccharide, and having a considerable ratio of the oxidized polysaccharide formulations were prepared similar to those used in or better bond strength. 本发明通过提供组织粘合剂和密封剂解决了上述需求，所述组织粘合剂和密封剂通过使聚甘油醛与水分散性多臂胺反应形成，所述聚甘油醛在水溶液中比氧化多糖更稳定。  The present invention is solved by providing a tissue adhesives and sealants of the aforementioned needs, the tissue adhesives and sealants by reacting an amine with an aldehyde polyglycerol water-dispersible multi-arm is formed, the aldehyde in an aqueous solution of polyglycerol It is more stable than the oxidized polysaccharide. b)至少一种水分散性多臂胺，其中至少三个臂被至少一个伯胺基封端，其中所述多臂胺具有约450至约200，000道尔顿的数均分子量。  b) at least one water-dispersible multi-arm amine, wherein the at least three arms of at least one primary amine group is blocked, wherein the multi-arm amine having from about 450 to about 200,000 Daltons number average molecular weight . b)处理所述水凝胶以去除至少一部分所述溶剂，形成干燥的水凝胶。  b) treating the hydrogel to remove at least a portion of the solvent to form a dried hydrogel. b)至少一种水分散性多臂胺，其中至少三个臂被至少一个伯胺基封端，所述多臂胺具有约450至约200，000道尔顿的数均分子量。  b) at least one water-dispersible multi-arm amine, wherein the at least three arms of at least one primary amine group is terminated, the multi-arm amine having from about 450 to about 200,000 Daltons number average molecular weight. 其中所述至少一种聚甘油醛和所述至少一种水分散性多臂胺通过在聚甘油醛的醛基与水分散性多臂胺的伯胺基之间形成的共价键交联。  wherein the at least one polyglycerol aldehyde and at least one water-dispersible multi-arm amine by an aldehyde is formed between a polyglycerol primary amine with an aldehyde group of water-dispersible multi-arm amine covalent bond crosslinking. 向所述位点施用a)至少一种具有醛基的聚甘油醛，所述聚甘油醛具有约400至约20，000道尔顿的数均分子量，和约100至约3，000道尔顿的每醛基当量；接着施用b)至少一种水分散性多臂胺，其中至少三个臂被至少一个伯胺基封端，所述多臂胺具有约450至约200，000道尔顿的数均分子量，或施用（b)，接着施用（a)，或将（a)和（b)预混，并且在所得混合物完全固化之前，将所得混合物施用到所述位点上。  administering to the site a) at least one aldehyde group in an aldehyde polyglycerol, the polyglycerol aldehyde having from about 400 to about 20,000 Daltons, from about 100 to about 3,000 each aldehyde group equivalent daltons; followed by administration of b) at least one water-dispersible multi-arm amine, wherein the at least three arms of at least one primary amine group is terminated, the multi-arm amine having from about 450 to about 200,000 Daltons number average molecular weight, administered or (b), followed by administration of (a), or (a) and (b) pre-mixed and the resultant mixture was completely solidified before, and the resulting mixture is applied to the locus . 如本文所用，术语“聚甘油醛”是指包含经由醚键连接的甘油单体并且每分子具有3至约170个醛基的聚合物。  As used herein, the term "polyglycerol aldehyde" refers to a monomer containing glycerol via ether linkages per molecule and from 3 to about 170 polymer having aldehyde groups. 术语“醚键”是指两个取代或未取代的烷基或芳基经由氧原子连接的化学键（即RO-R')，使得R和R'均不包含另一个与形成醚键的碳原子直接连接的氧原子。  The term "ether linkage" means two substituted or unsubstituted alkyl group or a bond (i.e., RO-R ') an aryl group attached via an oxygen atom, such that R and R' are not formed contains another ether bond carbon atom directly attached to an oxygen atom. 即，醚键不是缩醛、缩酮、糖苷、酯或原酸酯部分的一部分。 I.e., an ether bond is not an acetal, ketal, glycosides, esters, or a portion of the orthoester moiety. 6的醛基数。 Number of aldehyde 6. 术语“m· η”是指由“m”代表的量乘以由“η”代表的量。  The term "m · η" refers to an amount of "m" represents an amount obtained by multiplying "η" represents. 术语“水分散性多臂胺”是指具有三个或更多个聚合物链（“臂”）的聚合物，所述聚合物链可为直链或支链，从中心结构发散出来，所述中心结构可为单个原子、核心分子、 或聚合物主链，其中至少三个支链（“臂”）被至少一个伯胺基封端。  The term "water-dispersible multi-arm amine" refers to a polymer having three or more polymer chains ( "arms"), the polymer chain may be linear or branched, diverging from the central structure out, the central structure may be a single atom, a core molecule, or a polymer backbone, wherein the at least three branches ( "arms") are terminated at least one primary amine. 水分散性多臂胺是水溶性的，或能够分散于水中，形成能够与水溶液或分散体中第二反应物反应的胶态悬浮液。 Water-dispersible multi-arm amine is water-soluble or can be dispersed in water to form capable of reacting with an aqueous solution or dispersion of the second reactant colloidal suspension. 术语“水分散性多臂聚醚胺”是指其中聚合物为聚醚的水分散性多臂胺。  The term "water-dispersible multi-arm polyether amine" refers to a polymer which is water-dispersible multi-arm polyether amine. 术语“聚醚”是指具有重复单元[-0-R]-的聚合物，其中R为具有2至5个碳原子的亚烃基。  The term "polyether" refers to a repeating unit [-0-R] - polymer, wherein R is a hydrocarbylene group having 2 to 5 carbon atoms. 所述聚醚还可为包含不同重复单元的无规或嵌段共聚物，所述不同的重复单元包含不同的R基团。 The polyether may also be a random or block copolymer containing different repeating units, the different repeating units containing different R groups. 术语“支化的聚醚”是指具有一个或多个枝点（“臂”）的聚醚，包括星形聚醚、树枝状聚醚、梳形聚醚、和超支化聚醚。  The term "branched polyether" refers to a polyether having one or more branch points ( "arms"), including star polyethers dendritic polyethers, polyether comb, hyperbranched polyether, and . 术语“树枝状聚醚”是指具有树状结构和99. 9-100%支化度（美国专利申请公布No. 2008/0045668)的高度支化的聚醚，所述支化度由D. Hdlter等人（“Acta Polym. ”，48 ： 30-35，1997)定义。  The term "dendritic polyether" refers to a polyether having a highly branched tree structure 99. 9-100% and a degree of branching (U.S. Patent Application Publication No. 2008/0045668), and the degree of branching (, 48 "Acta Polym. ": 30-35,1997) defined by the D. Hdlter et al. 术语“梳形聚醚”是指主链具有多个三官能枝点的聚醚，由每个所述三官能枝点发散出直链臂。  The term "comb polyether" refers to a polyether backbone having a plurality of trifunctional branch point, a linear arm emanates by each of said trifunctional branch points. 术语“星形聚醚”是指具有中心枝点的聚醚，所述枝点可以是单个原子或化学基团，由所述枝点发散出直链臂。  The term "star polyether" refers to a polyether having a central branch point, the branch point may be a single atom or a chemical group, from the branch point of the linear arm emanates. 指聚合物中的枝点相对于理论上可能的最大枝点数的百分比。 It refers to a branch point of the polymer in percentage of the maximum theoretically possible branch points. 术语“超支化”是指聚合物高度支化，具有由D. Hdltei^A (“Acta Polym. ”，48 ： 30-35，1997)定义的约10%至约99. 9%，更具体地讲约20%至约99%，并且更具体地讲约30%至约70%的支化度（美国专利申请公布No. 2008/0045668)。  The term "hyperbranched" means a highly branched polymer having a D. Hdltei ^ A (, 48 "Acta Polym. ": 30-35,1997) from about 10% to about 99.9% defined, more specifically from about 20% to about 99%, and more specifically from about 30% to about 70% of the degree of branching (U.S. Patent application publication No. 2008/0045668). 术语“多官能胺”是指包含至少两个官能团，其中至少一个为伯胺基的化合物。  The term "polyfunctional amine" refers to containing at least two functional groups, wherein the at least one primary amine group of the compound. 术语“交联”是指连接在两个不同聚合物链之间并且连接两个不同聚合物链的键或原子链。  The term "crosslinked" refers to a connection between two different polymer chains and is connected to two different polymer chains bond or a chain of atoms. 本文中，术语“交联密度”定义为交联连接位点之间链原子平均数的倒数。  As used herein, the term "crosslink density" is defined as the reciprocal of the cross-linking chain of atoms between the average number of attachment sites. 除非另外指明，术语“重量百分比”在本文中还被称为“wt%”，是指相对于溶液或分散体总重量的重量百分比。  Unless otherwise indicated, the term "weight percent" used herein is also referred to as "wt%", it refers to a percentage by weight relative to the total weight of the solution or dispersion. 术语“解剖位点”是指人体或动物体的任何外部或内部部分。  The term "anatomical site" refers to any internal or external part of the human or animal body. 术语“组织”是指人体或动物体中的任何活的或死亡的生物组织。  The term "organization" means any living biological tissue of the human or animal body or death. 术语“水凝胶”是指由高分子三维网络组成的水可溶胀的聚合物基质，所述高分子通过共价交联保持在一起，所述聚合物基质可吸收大量水而形成弹性凝胶。  The term "hydrogel" means a three-dimensional network consisting of a polymer of water-swellable polymeric matrix, said crosslinked polymer by covalent held together, the polymer matrix can absorb large amounts of water to form elastic gel. 如本文所用，术语“PEG”是指聚（乙二醇）。  As used herein, the term "PEG" refers to poly (ethylene glycol). 如本文所用，术语“Mw”是指重均分子量。  As used herein, the term "Mw" means weight average molecular weight. [0051 ] 如本文所用，术语“Mn”是指数均分子量。  As used herein, the term "Mn" is number average molecular weight. 如本文所用，术语“医学应用”是指与人和动物相关的医学应用。  As used herein, the term "medical applications" refers to medical applications associated with humans and animals. 术语“亚胺键”是指在下文结构I中标记为“C”的碳原子与NHR5之间表示的碳-氮双键，其中R4和R5各自独立地为未取代或取代的烃基。  The term "imine bond" means a carbon represented by the structure I below between labeled "C" the NHR5 carbon atom - nitrogen double bond, wherein R4 and R5 are each independently an unsubstituted or substituted hydrocarbon group . “缩醛胺键”为结构II中标记为“C” 的碳原子与NHR7或NHR8之间表示的碳-氮单键，其中R6、R7和R8各自独立地为未取代或取代的烃基。 Carbon represented between NHR7 or NHR ?, "aminal bond" structure II is labeled "C" a carbon atom - nitrogen bond, wherein R6, R7 and R8 are each independently an unsubstituted or substituted hydrocarbon group. “半缩醛胺键”为结构III中标记为“C”的碳原子与NHRw之间表示的碳-氮单键，其中R9和Rki各自独立地为未取代或取代的烃基。 Carbon represents between "hemiaminal key" for the structure III labeled "C" NHRw the carbon atom - nitrogen bond, wherein R9 and Rki each independently an unsubstituted or substituted hydrocarbon group. 所用缩写的含义如下：“min”是指分钟，“h”是指小时，“sec”是指秒，“d”是指天， “mL”是指毫升，“L”是指升，“ μ L”是指微升，“cm”是指厘米，“mm”是指毫米，“ μ m，，是指微米，“mol”是指摩尔，“mmol”是指毫摩尔，“g”是指克，“mg”是指毫克，"wt%"是指重量百分比，“mol %，，是指摩尔百分比，“Vol”是指体积，"ν/ν"是指体积/体积，"w/w"是指重量/重量，“Da”是指道尔顿，“kDa”是指千道尔顿，标记“10K”是指聚合物分子具有10千道尔顿的数均分子量，“M”是指摩尔浓度，“kPa”是指千帕斯卡，“NMR”是指核磁共振波谱，“ΐ NMR"是指质子核磁共振波谱，"13C NMR"是指碳-13核磁共振波谱，“ppm”是指份每一百万份，“PBS”是指磷酸盐缓冲的盐溶液，“MWC0”是指截留分子量，“psi”是指磅/平方英寸， “丽”是指分子量，“  The meaning of abbreviations used is as follows: "min" means minutes, "h" means hours, "sec" means seconds, "d" means day, "mL" means milliliter, "L" refers to liters , "μ L" refers to microliters, "cm" refers to centimeters, "mm" means millimeter, "μ m ,, m refers," mol "refers to moles," mmol "refers to millimoles," g "refers to grams," mg "means milligram," wt% "means weight percent," mol% ,, refers to the mole percent of "vol." refers to the volume, "v / v" means volume / volume, " w / w "refers to weight / weight," Da "means Dalton," kDa "means kilodaltons, labeled" 10K "means a polymer molecule having 10 kilodaltons number average molecular weight," M "means molar concentration," kPa "refers to kilopascals," NMR "refers to nuclear magnetic resonance spectroscopy," ΐ NMR "refers to proton nuclear magnetic resonance spectroscopy," 13C NMR "refers 13C NMR," ppm "refers to parts per million," PBS "refers to phosphate buffered saline," MWC0 "refers to a molecular weight cutoff," PSI "refers to pounds / square inch," Korea "means molecular weight," FW”是指式量，“MHz”是指兆赫，“SEC”是指尺寸排阻色谱，“dn/dc”是指比折光指数增量（即折射率变化/浓度变化），“cP”是指厘泊。 FW "means formula weight," MHz "means megahertz," SEC "means size exclusion chromatography," dn / dc "means the ratio of the refractive index increment (i.e., the refractive index change / change in concentration)," cP "is It refers cps. 本文所公开的是通过聚甘油醛与水分散性多臂胺反应形成的水凝胶组织粘合剂和密封剂。  as disclosed herein is a hydrogel tissue adhesives and sealants formed by reaction of an aldehyde with an amine polyglycerol water-dispersible multi-arm. 所述聚甘油醛在水溶液中比氧化多糖更稳定，从而使得组织粘合剂更实用于商业用途。 The polyglycerol aldehyde in aqueous solution is more stable than the oxidized polysaccharide, such that the tissue adhesive is more practical for commercial use. 水凝胶组织粘合剂和密封剂可用于医学和兽医学应用，包括但不限于闭合伤口、补充或替代体内手术操作如肠吻合术和血管吻合术中的缝合线或卡钉、组织修复、防止流体如血液、胆汁、胃肠液和脑脊液渗漏、眼科手术、药物递送、以及防止术后粘连。 Hydrogel tissue adhesives and sealants can be used for medical and veterinary applications, including but not limited to wound closure, to supplement or replace sutures in vivo surgical procedure such as intestinal anastomosis and vascular anastomosis or staple, tissue repair, preventing fluids such as blood, bile, gastrointestinal fluid and cerebrospinal fluid leakage, eye surgery, drug delivery, and to prevent postoperative adhesions. 聚甘油醛是包含经由醚键连接的甘油单体并且每分子具有3至约170个醛基的聚合物。  polyglycerol glycerol aldehyde monomer comprising an ether bond and is connected via a polymer having per molecule from 3 to about 170 aldehyde groups. 可用的聚甘油醛具有约400至约20，000道尔顿，更具体地讲约1，000至约20，000道尔顿，更具体地讲约2，000至约20，000道尔顿，并且更具体地讲约2，000至约10，000道尔顿的数均分子量；和约100至约3，000道尔顿，更具体地讲约100至约2，000道尔顿，更具体地讲约100至约1，500道尔顿，更具体地讲约200至1，500道尔顿，更具体地讲约100至约1，000道尔顿，更具体地讲约100至约800道尔顿，更具体地讲约200至约800道尔顿， 并且更具体地讲约200至约400道尔顿的每醛基当量。 Polyglycerol available aldehydes having from about 400 to about 20,000 Daltons, more particularly from about 1,000 to about 20,000 Daltons, more particularly from about 2,000 to about 20,000 Daltons , and more particularly a number from about 2,000 to about 10,000 Daltons; from about 100 to about 3,000 daltons, more particularly from about 100 to about 2,000 daltons, and more particularly from about 100 to about 1,500 Daltons, more particularly from about 200 to 1,500 Daltons, more particularly from about 100 to about 1,000 daltons, more particularly from about 100 to about 800 Daltons, more particularly from about 200 to about 800 daltons, and more particularly aldehyde group per equivalent weight from about 200 to about 400 daltons. 其中：A为（a)通过从包含1至20个碳原子和1至8个羟基的醇或多元醇上移除一个或多个羟基而衍生的烃基，或（b)通过从（i)包含1至20个碳原子和1至8个羟基的醇或多元醇与（ii) 一种或多种环状醚如环氧乙烷、甲基环氧乙烷、氧杂环丁烷或氧杂环戊烷的反应产物上移除一个或多个羟基而衍生的氧杂烃基或多氧杂烃基，其中反应产物的Mn 等于或小于5，OOODa ；R1为氢原子、1至8碳的烃基、R2-O-[R3-CHO]p、或R3-CHO ；R2为包含1 至270个经由醚键连接的甘油单元的聚合链段；R3为包含1至8个碳原子的亚烃基；η = 1 至8 ;m · η = 3至170 ；并且ρ = 1至40。  wherein: A is (a) by removing one or more hydroxyl groups comprising from 1 to 20 carbon atoms and 1 to 8 hydroxyl groups on the alcohol or polyol derived hydrocarbon group, or (b) by the ( i) comprises 1 to 20 carbon atoms and 1 to 8 hydroxyl groups or polyol and (ii) one or more cyclic ethers such as ethylene oxide, methyl oxirane, oxetane removing the reaction product or oxolane one or more hydroxyl groups derived oxaalkyl or oxaalkyl, wherein the reaction product Mn less than or equal to 5, OOODa; R1 is a hydrogen atom, from 1 to 8 carbon hydrocarbon group, R2-O- [R3-CHO] p, or R3-CHO; R2 comprising 1 to 270 glycerol units linked via an ether bond polymeric segment; R3 is containing from 1 to 8 carbon atoms, alkylene ; η = 1 to 8; m · η = 3 to 170.; and ρ = 1 to 40. R2还可包含其它单体，包括但不限于环氧乙烷、 甲基环氧乙烷、氧杂环丁烷和氧杂环戊烷。 R2 may also comprise other monomers, including but not limited to ethylene oxide, methyl oxirane, oxetane and oxolane. 在一个实施方案中，通式（1)中的A为CH3CH2C(CH2-)3，其通过从三羟甲基丙烷上移除三个羟基获得；R2为由1至60个经由醚键连接的甘油单元构成的聚合链段；R3 为-CH2- ；R1 为氢原子、R2-O-[R3-CHO]p、或R3CHO ；m = 1 至30 ;n = 3 ；并且ρ = 1 至30。  In one embodiment, A is of formula (1) CH3CH2C (CH2-) 3, which is obtained by removing hydroxy group from the three trimethylolpropane; 1-60 by R2 via ether polymeric segment glycerol units composed of bonds; R3 is -CH2-; R1 is a hydrogen atom, R2-O- [R3CHO] p, or R3CHO; m = 1 to 30; n = 3; and ρ = 1 30. 聚甘油醛可由聚甘油制得，聚甘油可从公司如Hyperpolymers GmbH (Freiburg, Germany)商购获得。  Poly glyceraldehyde be prepared polyglycerol, the polyglycerol may be as Hyperpolymers GmbH (Freiburg, Germany) are commercially available from the company. 此外，适宜的聚甘油可使用本领域已知的方法制得，如Sunder等人(“Macromolecules", 32 :4240-4246,1999)；美国专利No. 6，765，082 和6，822，068 以及美国专利申请公布No. 2003/0120022中描述的那些。 Furthermore, suitable polyglycerol known in the art may be prepared by methods such as Sunder, et al. ( "Macromolecules", 32: 4240-4246,1999); U.S. Pat. No. 6,765,082 and 6,822,068 and US Patent application publication No. 2003/0120022 describes. 如本领域已知，聚甘油通常是具有不同分子量分布的非均勻混合物，并且特征在于平均分子量，例如重均分子量（Mw)或数均分子量（Mn)。 As known in the art, typically a polyglycerol heterogeneous mixture of different molecular weight distributions, and wherein the average molecular weight, for example weight average molecular weight (Mw) or number average molecular weight (Mn). 适宜的聚甘油具有约400至约20，000道尔顿，更具体地讲约1，000至约20，000 道尔顿，更具体地讲约2，000至约20，000道尔顿，并且更具体地讲约2，000至约10，000道尔顿的数均分子量。 Suitable polyglycerol having from about 400 to about 20,000 Daltons, more particularly from about 1,000 to about 20,000 Daltons, more particularly from about 2,000 to about 20,000 daltons, and more particularly from about 2,000 to about 10,000 daltons, a number average molecular weight. 甘油、二季戊四醇、山梨醇、甘露糖醇和六甘油。 Glycerol, dipentaerythritol, sorbitol, mannitol and hexaglycerol. 此外，由通式（1)中的A代表的聚甘油核心可衍生自已被乙氧基化、丙氧基化、或换句话讲通过与一种或多种环状醚如环氧乙烷、甲基环氧乙烷、氧杂环丁烷或氧杂环戊烷反应而烷氧基化的醇或多元醇。 In addition, the polyglycerol core A represents the general formula (1) may themselves be derived ethoxylated, propoxylated, or otherwise by one or more cyclic ethers such as ethylene oxide , oxirane, oxetane, or oxacyclopentane reacting alkoxylated alcohols or polyols. 乙氧基化和丙氧基化的醇和多元醇是可商购获得的，并且制备它们的方法是本领域熟知的。 Ethoxylated and propoxylated alcohols and polyols are commercially available, and methods of making them are well known in the art. 它们由例如Aldrich Chemical Company>Perstorp Polyols,Inc. (Toledo, OH)、Spectrum Chemicals(Gardena, CA)和Wako Pure Chemical hdustries (Osaka，Japan)销售。 They consist, for example, Aldrich Chemical Company> Perstorp Polyols, Inc. (Toledo, OH), Spectrum Chemicals (Gardena, CA) and Wako Pure Chemical hdustries (Osaka, Japan) sales. 它们可根据例如美国专利申请公布2004/0096507和2006/0135391以及国际专利申请公布WO 1986/002635、EP 0395316,WO 2003/0270¾和WO 2006/106122中公开的方法制得。 They may, for example, according to U.S. Patent Application Publication 2004/0096507 and 2006/0135391 as well as International Patent Application Publication WO 1986/002635, EP 0395316, WO 2003 / 0270¾ disclosed in WO 2006/106122 and methods. 通过无规或嵌段共聚反应乙氧基化和丙氧基化的醇和多元醇是可商购获得的，并且制备它们的方法是本领域熟知的。 By random or block copolymerization of ethoxylated and propoxylated alcohols and polyols are commercially available, and methods of making them are well known in the art. 它们由例如Aldrich Chemical Company销售。 For example, they are sold by Aldrich Chemical Company. 它们可根据例如国际专利申请公布WO 2004/076528中公开的方法制得。 They may, for example, according to International Patent Application Publication WO 2004/076528 disclosed methods. 9 聚甘油醛还可由包含其它环氧化物单体的聚甘油制得，所述其它环氧化物单体包括但不限于环氧乙烷和甲基环氧乙烷。 9  may also be prepared from polyethylene glyceraldehyde polyglycerol epoxide prepared containing other monomer, the other monomers include, but are not limited to epoxide ethylene oxide and oxirane. 包含其它环氧化物单体的聚甘油可根据本领域已知的方法制得，如美国专利No. 6，765，082中所述的那些。 Further comprising polyglycerol epoxide monomer can be prepared according to methods known in the art, such as those described in U.S. Patent No. 6,765,082. 聚甘油醛可通过使用任何适宜的氧化剂，将上述适宜的聚甘油氧化以引入醛基来制得，所述氧化剂包括但不限于高碘酸、可溶性或不溶性高碘酸盐、聚合物结合的高碘酸盐、吸附在不溶性载体如硅胶上的高碘酸盐、四乙酸铅、催化性三苯基铋和N-溴代琥珀酰亚胺或溴和碳酸钾（DHR Barton 等人，"Tetrahedron", 42 :5627-5636,1986 ； WO 2004/087634)、N-碘琥珀酰亚胺、以及氧气和催化剂如三（三苯基膦）二氯化钌(II)。  Poly glyceraldehyde by using any suitable oxidizing agent, the oxidation of the aforementioned suitable polyglycerol be prepared to introduce an aldehyde group, the oxidizing agent including but not limited to periodic acid, periodate salts soluble or insoluble polymer periodate bound, adsorbed on an insoluble support such as on silica gel periodate, lead tetraacetate, catalytic triphenylbismuth and N- bromosuccinimide or bromine and potassium carbonate (DHR Barton et al., "Tetrahedron", 42: 5627-5636,1986; WO 2004/087634), N- iodosuccinimide, as well as oxygen and a catalyst such as tris (triphenylphosphine) ruthenium dichloride (II). 例如，聚甘油可通过与高碘酸钠反应氧化，如下文实施例中更详细描述的。 For example, polyglycerol may be oxidized by reaction with sodium periodate, as described in the embodiment described in more detail. 聚甘油可与不同量的高碘酸盐反应获得具有不同氧化度，从而具有不同醛基数（即不同的每醛基当量）的聚甘油醛。 Polyglycerol polyglycerol may be obtained with different degree of oxidation of aldehyde, to have different numbers (i.e., different aldehyde group per equivalent) aldehyde periodate reaction with varying amounts. 聚甘油醛的氧化度可采用本领域已知的方法测定。 Determination of degree of oxidation of the aldehyde polyglycerol methods known in the art may be employed. 例如，可由分光光度法（M. Sugimoto等人，WO 9901480)，或通过用氧化银和硫氰酸钾（JAMayes 等人，"Analytical. Chemistry”，36 =934-935,1964)、亚硫酸氢钠和碱(S. Siggia 等人， "Analytical. Chemistry”，19 :1023-1025,1947)、或羟胺盐酸盐和碱滴定(H. Zhao 等人， "Pharmaceutical Research”，8 :400_402，1991)，测定醛基密度（摩尔当量/克）。 For example, by spectrophotometric method (M. Sugimoto et al., WO 9901480), or by treatment with silver oxide and potassium thiocyanate (JAMayes et al., "Analytical. Chemistry", 36 = 934-935,1964), bisulphite sodium and a base (S. Siggia et al., "Analytical Chemistry. ", 19: 1023-1025,1947), and a base, or hydroxylamine hydrochloride titration (H. Zhao et al., "Pharmaceutical Research", 8: 400_402,1991 ), the density of aldehyde groups was measured (molar equivalent / g). 作为另外一种选择，可采用核磁共振（NMR)波谱测定聚甘油醛的氧化度。 Alternatively, NMR may be employed (NMR) spectrum was measured degree of oxidation of the aldehyde polyglycerol. 聚甘油醛还可通过采用本领域已知的方法，将适宜的聚甘油化学改性以使醛基共价连接到聚合物上来制得。  Poly glyceraldehyde also by methods known in the present art, a suitable polyglycerol chemically modified so that aldehyde groups covalently attached to the polymer made up. 例如，可用包含被掩蔽醛基的化合物烷化或酰化聚甘油的羟基。 For example, usable compounds containing masked aldehyde group alkylated or acylated hydroxy polyglycerol. 被掩蔽醛基的实例包括环状和无环的缩醛和硫缩醛。 Masked aldehyde group include cyclic and acyclic acetals and thioacetal. 包含被掩蔽醛基的烷基化试剂包括但不限于2-卤代乙醛、3-卤代丙醛和4-卤代丁醛的二甲基、二乙基以及其它二烷基缩醛和硫缩醛，以及1，3- 二氧杂环戊烷、1，3- 二氧杂环己烷、1，3- 二硫戊环和1，3- 二噻烷的2-(卤代甲基）-、2-(2_卤代乙基）-和2-(3-卤代丙基）衍生物，其中“卤代”是氯代、溴代或碘代。 Masked aldehyde group comprising alkylating agents include but are not limited to, 2-halo-acetaldehyde, propionaldehyde and 3-halo-4-halo-dimethyl-butyraldehyde, diethyl acetal, and other dialkyl and thioacetal, and 1,3-dioxolane, 1,3-dioxane, 1,3-dithiolane and 1,3-dithiane 2- (haloformates yl) - 2- (2_ haloethyl) - and 2- (3-halopropyl) derivative, where "halo" is a chloro, bromo or iodo. 包含被掩蔽醛基的酰化试剂包括但不限于3，3_ 二甲氧基丙酰氯、2-(1，3-二氧杂环戊烷-2-基）乙酰氯、2-(1，3-二氧杂环己烷-2-基）乙酰氯、2-(1，3-二硫戊环-2-基） 乙酰氯、和2-(1，3-二噻烷-2-基）乙酰氯、以及3-(1，3-二氧杂环戊烷-2-基）丙酰氯、 3-(1，3-二氧杂环己烷-2-基）丙酰氯、3-(1，3-二硫戊环-2-基）丙酰氯、和3_(1，3_ 二噻烷-2-基）丙酰氯。 Masked aldehyde comprising acylating agents include, but are not limited to 3,3_ dimethoxy propionyl chloride, 2- (1,3-dioxolan-2-yl) acetyl chloride, 2- (1,3 - dioxan-2-yl) acetyl chloride, 2- (1,3-dithiolane-2-yl) acetyl chloride, and 2- (1,3-thiazol-2-yl) acetyl chloride, and 3- (1,3-dioxolan-2-yl) propionyl chloride, 3- (1,3-dioxan-2-yl) propionyl chloride, 3- (1 , 3-dithiolan-2-yl) propionyl chloride, and 3_ (1,3_ dithian-2-yl) propionyl chloride. 用包含被掩蔽醛基的化合物将甘油烷化或酰化之后，醛基可通过例如温和酸催化或金属催化的缩醛和硫缩醛水解反应解掩蔽。 After the masked aldehyde compound comprises glycerol alkylated or acylated, for example, aldehyde groups may be unmasked by mild acid-catalyzed or metal-catalyzed hydrolysis acetals and thioacetal. 还可用包含官能团的化合物烷化或酰化聚甘油中的羟基，所述官能团能够随后被氧化或还原成醛。  The compound may further comprise an alkoxy functional group or acylation of hydroxyl groups in the polyglycerol, the functional group can then be oxidized or reduced to an aldehyde. 可被氧化成醛的官能团实例是碳-碳双键和伯醇。 Examples of functional groups can be oxidized to the aldehyde is a carbon - carbon double bonds and a primary alcohol. 可被还原成醛的官能团实例是羧酸和酯。 Examples of functional groups may be reduced to an aldehyde and the carboxylic acid esters. 可通过例如臭氧分解，双羟基化，接着二醇裂解和环氧化，随后水解，将碳-碳双键氧化成醛。  for example, by ozonolysis, dihydroxylation followed by diol cleavage and epoxidation followed by hydrolysis, the carbon - carbon double bond is oxidized to the aldehyde. 可使用例如四氧化锇、锇酸盐如锇酸钾、或高锰酸盐如高锰酸钾来实现碳-碳双键的双羟基化。 May be used, for example, osmium tetraoxide, potassium osmate such as osmium, permanganate such as potassium permanganate or to achieve a carbon - carbon double bonds double hydroxylation. 可使用例如高碘酸、高碘酸盐如高碘酸钠或高碘酸钾、四乙酸铅、催化性三苯基铋和N-溴代琥珀酰亚胺、N-碘代琥珀酰亚胺或溴、或氧气和催化剂如三（三苯基膦）二氯化钌（II)，将所得二醇裂解。 It may be used, for example periodic acid, a periodate salt such as sodium periodate or potassium periodate, lead tetraacetate, catalytic triphenylbismuth and N- bromosuccinimide, N- iodosuccinimide or bromine, or oxygen and a catalyst such as tris (triphenylphosphine) ruthenium (II) dichloride, and the resulting diol cleavage. 可使用过氧化氢、烷基过氧化物如叔丁基过氧化物、 过氧羧酸如间氯过苯甲酸、过甲酸、过乙酸、单过氧酞酸和单过氧酞酸镁、双环氧乙烷如二甲基双环氧乙烷和双（三氟甲基）双环氧乙烷、双氧和适宜的催化剂、亚碘酰苯、次氯酸、次氯酸盐如次氯酸钠、或过硫酸钾，将碳-碳双键环氧化。 May be hydrogen peroxide, alkyl peroxides such as t-butyl peroxide, peroxy acid such as m-chloroperbenzoic acid, performic acid, peracetic acid, monoperoxy phthalic acid and phthalic acid, magnesium monoperoxyphthalate, bis ethylene oxide such as dimethyl dioxirane and bis (trifluoromethyl) dioxirane, dioxygen and a suitable catalyst, iodosobenzene, hypochlorous acid, hypochlorites such as sodium hypochlorite, or potassium persulfate, a carbon - carbon double bond epoxidized. 可使用例如氯铬酸吡啶、重铬酸盐如重铬酸钠、重铬酸钾和重铬酸吡啶锡、(二乙酰氧基碘）苯、戴斯-马丁氧化剂、或其中二甲基亚砜（DMSO)为最终氧化剂（如Swern和Pfitzner-Moffatt氧化反应中）的体系，将伯醇氧化成醛。  may be used, for example pyridinium chlorochromate, dichromates such as sodium dichromate, potassium dichromate and pyridinium dichromate tin, (diacetoxyiodo) benzene, Dess - Martin, two, or wherein methyl sulfoxide (DMSO) as the final oxidant (e.g., Swern oxidation and in Pfitzner-Moffatt) system, a primary alcohol is oxidized to an aldehyde. 本领域技术人员认识到，使用包含伯羟基的化合物烷化或酰化聚甘油时，可采用本领域已知的多种基团中的任一种来掩蔽或“保护”羟基，所述基团包括但不限于Wuts和Greene ( "Greene' s Protective Groups in Organic Synthesis”，第4版；Wiley，2006 ；第2章）所述的那些。 Compound skilled in the art recognize that the use of primary hydroxyl group containing acylated or alkylated polyglycerol, known in the art may be employed any of a variety of groups to mask or "protected" hydroxy, the group including but not limited to Wuts and Greene ( "Greene 's Protective Groups in Organic Synthesis", 4th edition; Wiley, 2006; Chapter 2) those described. 具体地讲，伯羟基可被掩蔽为苄基醚或取代的苄基醚、叔丁基醚、甲硅烷基醚、或四氢吡喃醚。 Specifically, the primary hydroxy group may be masked as a benzyl ethers or substituted benzyl ethers, tert-butyl ether, silyl ether or tetrahydropyranyl ether. 可使用例如三叔丁氧基氢化铝锂、氢化二异丁基铝（DIBAL-H)、三甲基丙基氯硼烷-二甲基硫、9-硼双环[3. 3. 1]壬烷、或次磷酸钠以及三甲基乙酸酐和作为催化剂的乙酸钯-三环己基膦，将羧酸还原成醛。  may be used, for example lithium aluminum tri-t-butoxy hydride, diisobutylaluminum hydride (DIBAL-H), borane-trimethyl-propyl chloride - dimethylsulfide, 9-borabicyclo [3.3. 1] nonane, or sodium hypophosphite and trimethyl acetic anhydride and a palladium acetate catalyst - tricyclohexylphosphine, reduction of the carboxylic acid to an aldehyde. 可使用例如DIBAL-H将羧酸酯还原成醛。 DIBAL-H can be used, for example, the carboxylic acid ester is reduced to the aldehyde. 作为另外一种选择，可使用例如氢化铝锂、硼氢化锂、氨基硼氢化锂如二乙基氨基硼氢化锂、硼氢化锌或硼氢化钠，将羧酸酯还原成相应的伯醇，然后如上所述再氧化成醛。 Alternatively, for example, using lithium aluminum hydride, lithium borohydride, lithium borohydride such as amino diethylamino lithium borohydride, zinc borohydride or sodium borohydride, the reduction of carboxylic esters to the corresponding primary alcohols, then as described above reoxidation to the aldehyde. 可用于将碳-碳双键连接到聚甘油上的试剂实例包括但不限于烯丙基氯、烯丙基溴、烯丙基碘、3- 丁烯基氯、3- 丁烯基溴、3- 丁烯基碘、烯丙基缩水甘油醚、4-戊烯酰氯、和异氰酸烯丙酯。  may be used carbon - carbon double bond is connected to the polyglycerol Examples of agents include, but are not limited to, allyl chloride, allyl bromide, allyl iodide, 3-butenyl chloride, 3-butenyl bromo, iodo-3-butenyl, allyl glycidyl ether, 4-pentenyl chloride, and allyl isocyanate. 可用于将被掩蔽的伯醇连接到聚甘油上的试剂实例包括但不限于2_(三甲基硅氧基）乙基异氰酸酯、2-苄氧基乙基异氰酸酯、氯甲酸2-(苄氧基）乙酯、氯甲酸2-(苄氧基）乙氧基）乙酯、（2-苄氧基乙氧基）乙酰氯、1-苄氧基-2-氯甲氧基乙烷。 Can be used to connect to the primary alcohol masking agent instance polyglycerol include but are not limited 2_ (trimethylsilyloxy) ethyl isocyanate, 2-benzyloxy-ethyl isocyanate, chloroformate 2- (benzyloxy ), ethyl chloroformate, 2- (benzyloxy) ethoxy) ethyl, (2-benzyloxy-ethoxy) acetyl chloride, 1-benzyl-2-chloro-methoxyethane. 可用于将羧酸或酯连接到聚甘油上的试剂实例包括但不限于氯乙酸、溴乙酸、碘乙酸、氯乙酸甲酯或乙酯、溴乙酸甲酯或乙酯、碘乙酸甲酯或乙酯、异氰酰乙酸乙酯和氯甲酸乙氧基羰基甲酯。 It is used to connect the reagent to the carboxylic acid or ester polyglycerol instance include but are not limited to acid, bromoacetic acid, iodoacetic acid, methyl or ethyl chloroacetate, methyl bromoacetate or ethyl acetate or methyl iodoacetate ester, isocyanato ethyl chloroformate ethoxycarbonyl ester. 可采用上述方法，测定掺入到聚甘油中的醛基量。  The above-described method can be, incorporated into the determination of the amount of aldehyde groups in the polyglycerol. 在一个实施方案中，聚甘油醛是超支化的，具有约10%至约99.9%，更具体地讲约20%至约99%，并且更具体地讲约30%至约70%的支化度。  In one embodiment, the polyglycerol aldehyde is hyperbranched, having about 10% to about 99.9%, more particularly from about 20% to about 99%, and more specifically from about 30% to about 70% the degree of branching. 可由本领域已知的多种方法中的任一种，测定支化度，所述方法包括但不限于NMR光谱法。 It may be any of a variety of methods known in the art, determination of the degree of branching, including but not limited to, NMR spectroscopy. 聚甘油醛的支化度可通过在其前体聚甘油被如上所述氧化或化学改性以引入醛基之前，测定前体聚甘油的支化度来确定，这是因为如上所述的聚甘油氧化和化学改性不改变聚合物的支化度。 The degree of branching can be obtained by polyglycerol poly aldehyde precursors thereof as described above, the polyglycerol is oxidized as described above or chemical modification prior to introduction of aldehyde groups, the degree of branching measured polyglycerol determined precursor, which is glycerol oxidase and the chemical modification does not change the degree of branching of the polymer. 由"C NMR波谱测定聚甘油支化度的方法已由A. Sunder等人(“Macromolecules”， 32:4240-4246,1999)描述。作为另外一种选择，聚甘油的支化度可由其数均分子量（Mn) 和其每末端二醇部分的当量计算出来。可由本领域已知的方法测定数均分子量，所述方法包括但不限于SEC和NMR波谱。可通过例如用高碘酸钠将二醇部分完全氧化，然后采用如R-Belcher 等人("Analytica Chimica Acta”，41 :395-397,1968)的方法，对所得反应溶液滴定碘酸钠和残余的高碘酸钠，测定每末端二醇部分的当量。对于给定的Mn，可计算出若干个支化度的每末端二醇部分理论当量，以将支化度相对于每末端二醇部分当量作图。可采用非线性回归确定最佳拟合计算点的曲线，并且可使用所得非线性回归公式，基于如上所述测得的受关注聚甘油的Mn和每末端二醇部分当量，计算出支化度。  by the "method for determining the polyglycerol C NMR spectra by the degree of branching A. Sunder, et al. (" Macromolecules ", 32: 4240-4246,1999), as described Alternatively, the degree of branching polyglycerol. its number average molecular weight may be (Mn) and diol equivalents each of its end portions is calculated. Determination of the number of methods known in the art may average molecular weight, including but not limited to the SEC and NMR spectroscopy may be used, for example, by periodate sodium diol partially complete oxidation, and then using such R-Belcher et al ( "Analytica Chimica Acta", 41: 395-397,1968) method, the resulting reaction solution of sodium iodide and titration of the residual sodium periodate Determination equivalents per terminal diol moiety. for a given Mn, calculated theoretical equivalent each end portion of a plurality of diol degree of branching, degree of branching to a terminal diol per equivalent mapping portion may be using non-linear regression to determine the best fit curve calculation point, and may use the resulting non-linear regression equation based on measured as described above interest polyglycerol Mn per terminal diol equivalent portion, to calculate the degree of branching. 适宜的水分散性多臂胺包括但不限于水分散性多臂聚醚胺、氨基封端的树枝状聚酰氨基胺、和末端支化的多臂胺。  Suitable water-dispersible, multi-arm polyether amines include, but are not limited to, water-dispersible amine, amino-terminated dendritic polyamidoamines, and a branched multi-arm amine end. 通常，所述多臂胺具有约450至约200，000道尔顿，更具体地讲约2，000至约40，000道尔顿的数均分子量。 Typically, the multi-arm amine having from about 450 to about 200,000 Daltons, more particularly from about 2,000 to about 40,000 daltons, a number average molecular weight. 在一个实施方案中，所述水分散性多臂胺为多臂聚醚胺，它是具有重复单元[-0-R]-的水分散性聚醚，其中R为具有2至5个碳原子的亚烃基。  In one embodiment, the water-dispersible, multi-arm polyether amine is an amine, it is a repeating unit of [-0-R] - water dispersible polyether, wherein R is a 2-5 hydrocarbylene carbon atoms. 术语“亚烃基”是指通过从烃的两个不同碳原子的每一个上分别移除一个氢原子形成的二价基团。 The term "alkylene" refers to a divalent radical by removal of a hydrogen atom is formed from each of two different carbon atoms of a hydrocarbon, respectively. 适宜的多臂聚醚胺包括但不限于氨基封端的星形聚环氧乙烷、氨基封端的树枝状聚环氧乙烷、氨基封端的梳形聚环氧乙烷、氨基封端的星形聚环氧丙烷、氨基封端的树枝状聚环氧丙烷、氨基封端的梳形聚环氧丙烷、氨基封端的星形聚环氧乙烷-聚环氧丙烷共聚物、氨基封端的树枝状聚环氧乙烷-聚环氧丙烷共聚物、氨基封端的梳形聚环氧乙烷-聚环氧丙烷共聚物、以及以商品名Jeffamine®三胺由Huntsman LLC. (Houston, TX)出售的聚氧化烯三胺。 Suitable multi-arm polyether amines include, but star polyethylene oxides, amino-terminated limited to, amino-terminated dendritic polyethylene oxides, amino-terminated comb polyethylene oxides, amino-terminated star-shaped poly comb polypropylene oxide propylene oxide, amino-terminated dendritic polypropylene oxides, amino-terminated, amino-terminated star polyethylene oxide - polypropylene oxide copolymers, amino-terminated dendritic polyethylene oxide polyoxyalkylene oxide copolymers, and the tradename Jeffamine® triamines of Huntsman LLC (Houston, TX) sold - oxide - polypropylene oxide copolymers, amino-terminated comb polyethylene oxide. triamine. 星形聚环氧乙烷胺的实例包括但不限于各种多臂聚乙二醇胺，以及具有3、4、6或8个以伯胺封端的臂的星形聚乙二醇（本文分别称为3、4、6或8臂星形PEG胺）。 Examples of star polyethylene oxide amines include, but are not limited to various multi-arm polyethylene glycol amine, 3,4,6 or 8 and a polyethylene glycol, a star arm primary amine-terminated (this paper It referred 3,4,6 or 8-arm star PEG amine). 适宜的Jeffamine®三胺的实例包括但不限于Jeffamine ®T-403 (CAS No. 39423-51-3)、Jeffamine®T_3000 (CAS No. 64852-22-8)、和Jeffamine®T_5000 (CAS No. 64852-22-8)。 Examples of suitable triamines include but are not limited to, Jeffamine® Jeffamine ®T-403 (CAS No. 39423-51-3), Jeffamine®T_3000 (CAS No. 64852-22-8), and Jeffamine®T_5000 (CAS No. 64852-22-8). 在一个实施方案中，水分散性多臂聚醚胺为具有八个以伯胺基封端的臂并且具有约10，000道尔顿数均分子量的八臂聚乙二醇。 In one embodiment, the water-dispersible multi-arm polyether amine is a primary amine group having eight arms terminated and has a number average molecular weight of about 10,000 daltons in the eight-arm polyethylene glycol. 所述多臂聚醚胺可如上所述商购获得，或者可以使用本领域已知的方法制备。  The multi-arm polyether amines described above are commercially available, or prepared according to methods known in the art may be used. 例如，其中至少三个臂以伯胺基封端的多臂聚乙二醇可通过采用由Buckmarm等人描述的方法("Makromol. Chem. ”，182 :1379_1384，1981)，使氨基端基连接到多臂聚乙二醇（例如3、4、6 禾口8 臂星形聚乙二醇，得自公司如Nektar Transforming Therapeutics ；SunBio, Inc. (Anyang City, South Korea) ；NOF Corp. (Tokyo, Japan)；或JenKem Technology USA (Allen, TX))上制得。 E.g., wherein the at least three arms in a primary amine terminated multi-arm polyethylene glycol by the method ( "Makromol Chem..", 182: 1379_1384,1981) described by Buckmarm et al., The amino terminal group is attached to multi-arm polyethylene glycol (e.g. 3,4,6 Wo port 8-arm star polyethylene glycol, available from companies such as Nektar Transforming Therapeutics; SunBio, Inc. (Anyang City, South Korea); NOF Corp. (Tokyo, japan); or JenKem Technology USA (Allen, TX) prepared on). 在该方法中，使多臂聚乙二醇与亚硫酰溴反应，以将羟基转化成溴，其随后通过在100°C下与氨反应转化成胺。 In this method, the multi-arm polyethylene glycol with thionyl bromide to the hydroxyl group into bromine, which is then converted by reaction with ammonia at 100 ° C for an amine. 所述方法可广泛应用于制备其他多臂聚醚胺。 The method can be widely used in the preparation of other multi-arm polyether amine. 此外，多臂聚醚胺还可采用由Chenault描述的方法（共同未决并且共同拥有的美国专利申请公布No. 2007/0M9870)，由多臂多元醇制得。 In addition, multi-arm polyether amines may be employed by the methods described Chenault (copending and commonly owned U.S. Patent Application Publication No. 2007 / 0M9870), prepared from multi-arm polyols prepared. 在该方法中，使多臂聚醚与亚硫酰氯反应，以将羟基转化成氯基，其随后通过与氨水或无水氨反应转化成胺。 In this method, the multi-arm polyether is reacted with thionyl chloride to convert the hydroxy group to chlorine, which is then converted by reaction with aqueous ammonia or anhydrous ammonia to the amine. 可用于制备多臂聚醚胺的其它方法描述于Merrill等人的美国专利No. 5，830, 986和Chang等人的WO 97/30103 中。 Other methods useful for preparing multi-arm polyether amines are described in Merrill et al., U.S. Pat. No. 5,830, 986 and Chang et al., In WO 97/30103. 水分散性多臂胺还可为氨基封端的树枝状聚酰氨基胺，以商品名Marburst® Dendrimers 出售（得自Sigma-Aldrich(St Louis，MO))。  The water-dispersible amine may also be a multi-arm amino-terminated dendritic polyamidoamines, sold under the trade name Marburst® Dendrimers (available from Sigma-Aldrich (St Louis, MO)). 在一个实施方案中，水分散性多臂胺为末端支化的多臂胺，如Arthur所述（共同未决并且共同拥有的国际专利申请公布No. WO 2008/066787)。  In one embodiment, the multi-arm water-dispersible amine terminated multi-arm branched amines such as the Arthur (copending and commonly owned International Patent Application Publication No. WO 2008/066787). 所述末端支化的多臂胺为在聚合物臂末端具有两个或三个胺基的支链聚合物。 The end of the multi-arm branched amines having two or three amine groups at the end of the arm polymer chain branched polymer. 官能团的多重性增加了在指定链端处反应的统计概率，并且使支链分子更有效地掺入到网状聚合物中。 Multiple functional groups increases the statistical probability of reaction at the specified end of the chain, and the branched molecules more efficiently incorporate into the polymer network. 用于制备末端支化的胺的原料可以是支链聚合物如多臂聚醚多元醇，其包括但不限于梳形和星形聚醚多元醇。 Starting material for the preparation of branched end amines may be branched polymers such as multi-arm polyether polyols, including but not limited to comb and star polyether polyol. 末端支化的胺可采用本领域熟知的方法，通过与羟基反应将多个胺基团连接到所述聚合物末端来制得。 Branched end amines using methods well known in the art, by reaction with hydroxyl connecting the plurality of terminal amine groups of the polymer to be prepared. 例如，在每个聚合物臂末端具有两个胺官能团的末端支化的胺可如下制得：在适宜溶剂如甲苯中，使上列原料与亚硫酰氯反应获得氯化物衍生物，其随后与三（2-氨基乙基） 胺反应获得在聚合物臂末端具有两个伯胺基的末端支化的反应物。 For example, at the end of each arm a polymer having terminal amine functional groups of the two amines may be branched obtained as follows: in a suitable solvent such as toluene, so that the above raw material obtained by reacting thionyl chloride with the chloride derivative, which is subsequently reacted with tris (2-aminoethyl) amine is obtained having two primary amine terminal of the branched arm end of the polymer reactants. 应当认识到，水分散性多臂胺一般为一定程度上非均勻的混合物，其具有臂长分布，并且在一些情况下具有臂数不同的种类分布。  It should be appreciated that the amines are generally water-dispersible multi-arm to a certain extent as a non-homogeneous mixture, which has an arm length distribution, and have different numbers of arms species distribution in some cases. 当聚醚胺具有臂数不同的种类分布时，其可根据分布中的平均臂数来归属。 When different polyetheramine arm having a number of types of profile, which may be attributable to the average number of arms in the distribution. 例如，在一个实施方案中，多臂胺为8臂星形PEG胺，其包含多臂星形PEG胺的混合物，一些具有少于8个的臂，而一些具有多于8个的臂；然而混合物中的多臂星形PEG胺平均具有8个臂。 For example, in one embodiment, the multi-arm 8-arm star PEG amine is an amine comprising a mixture of multi-arm star PEG amine, some of which have less than eight arms, and some having more than 8 arms; however, multi-arm star PEG amine mixture having an average of 8 arms. 因此，如本文所用，涉及多臂胺的术语“8臂”、 “6臂”、“4臂”和“3臂”应解释为是指具有臂长分布的非均勻混合物，并且在一些情况下， 是指具有臂数不同的种类分布的非均勻混合物，在此情况下，所述臂数是指混合物中的平均臂数。 Thus, as used herein, the term relates to multi-arm amine "8-arm", "6-arm", "4-arm" and "third arm" should be interpreted to mean a non-homogeneous mixture having an arm length distribution, and in some cases It refers to a heterogeneous mixture having different numbers of arms distributed type, in this case, the number of arms is the average number of arms in the mixture. 本文所公开的水凝胶组织粘合剂可以多种形式使用。  The hydrogel tissue adhesive disclosed herein can be used in various forms. 在一个实施方案中，聚甘油醛和水分散性多臂胺以水溶液或分散体形式使用。 In one embodiment, the polyglycerol aldehyde and water-dispersible multi-arm amine used in the form of aqueous solutions or dispersions. 如本文所用，分散体是指能够与含水介质中第二反应物反应的胶态悬浮液。 As used herein, refers to a dispersion medium capable of reacting with the second reactant aqueous colloidal suspension. 为制备包含聚甘油醛的水溶液或分散体（本文称为“第一水溶液或分散体”)，将至少一种聚甘油醛加入到水中以获得相对于所述溶液或分散体总重量约5重量％至约40重量％，更具体地讲约5重量％至约30重量％，更具体地讲约10重量％至约30重量％，并且更具体地讲约20重量％至约30重量％的浓度。 For the preparation of an aldehyde comprising polyglycerol aqueous solution or dispersion (herein referred to as "the first aqueous solution or dispersion"), at least one polyglycerol aldehyde is added to water to obtain about 5 weight relative to the total weight of the solution or dispersion % to about 40 wt%, more particularly from about 5% to about 30 wt%, more particularly from about 10 wt% to about 30 wt%, and more particularly from about 20% to about 30% by weight concentration. 此外，可使用至少两种具有不同重均分子量、不同醛取代度（即不同的每醛基当量）、或不同重均分子量和醛取代度的不同聚甘油醛的混合物。 Further, at least two having different weight average molecular weights, different degrees of substitution aldehyde (aldehyde equivalents per i.e. different), or a different weight average molecular weight aldehydes and mixtures of different polyglycerol substituted aldehydes degrees. 当使用聚甘油醛混合物时，聚甘油醛的总浓度相对于所述溶液或分散体总重量为约5重量％至约40重量％，更具体地讲约5重量％至约30 重量％，更具体地讲约10重量％至约30%，并且更具体地讲约20重量％至约30重量％。 When a polyglycerol mixture of an aldehyde, an aldehyde polyglycerol total concentration with respect to the total weight of the solution or dispersion is from about 5 wt% to about 40 wt%, more particularly from about 5% to about 30 wt%, more particularly from about 10% to about 30 wt%, and more particularly from about 20% to about 30 wt%. 类似地，为制备包含水分散性多臂胺的水溶液或分散体（本文称为“第二水溶液或分散体”)，将至少一种水分散性多臂胺加入到水中以获得相对于所述溶液或分散体的总重量约5重量％至约70重量％，更具体地讲约10重量％至约50重量％，更具体地讲约20 重量％至约50重量％，并且更具体地讲约20重量％至约30重量％的浓度。  Similarly, to prepare a multi-arm water-dispersible amine-containing aqueous solution or dispersion (referred to herein as a "second aqueous solution or dispersion"), at least one water-dispersible multi-arm amine is added to water to obtain a relatively to the total weight of the solution or dispersion from about 5 wt% to about 70 wt%, more particularly from about 10 wt% to about 50 wt%, more particularly from about 20% to about 50% by weight, and more specifically, a concentration of about 30 wt% to about 20% by weight. 待用的最佳浓度取决于预期应用，并且取决于第一水溶液或分散体中所用的聚甘油醛浓度。 The optimum concentration depends on the intended application of the stand, and a first aldehyde concentration depending polyglycerol aqueous solution or dispersion used. 此外，可使用具有不同数均分子量、不同臂数、或不同数均分子量和不同臂数的不同水分散性多臂胺的混合物。 Further, having different number average molecular weight, a mixture of different water-dispersible multi-arm amine number of arms of various different number of arms, or a different number average molecular weight. 当使用水分散性多臂胺的混合物时，多臂胺的总浓度相对于所述溶液或分散体的总重量为约5重量％至约70重量％，更具体地讲约10重量％至约50重量％，更具体地讲约20重量％至约50重量％，并且更具体地讲约20重量％至约30重量％。 When a mixture of water-dispersible multi-arm amine, total concentration of multi-arm amine relative to the total weight of the dispersion or solution is from about 5 wt% to about 70 wt%, more particularly from about 10 wt% to about 50 wt%, more particularly from about 20% to about 50 wt%, and more particularly from about 20% to about 30 wt%. 为用于活性组织上，优选将第一水溶液或分散体和第二水溶液或分散体消毒，以防止感染。  for the living tissue, preferably the first aqueous solution or dispersion and the second aqueous solution or dispersion is sterilized to prevent infection. 可使用不会不利地影响组分反应形成有效水凝胶能力的任何本领域已知的适宜消毒方法，所述方法包括但不限于电子束辐射、Y辐射、环氧乙烷消毒、或通过0. 2 μ m孔膜超过滤。 Any of the art may be used without adversely affecting the components react to form an effective hydrogel capacity suitable known sterilization method, including but not limited to, electron beam radiation, Y irradiation, ethylene oxide sterilization, or by 0 . 2 μ m pore membrane ultrafiltration. 根据预期应用，第一水溶液或分散体和第二水溶液或分散体还可包含多种添加剂。  According to the intended use, the first aqueous solution or dispersion and the second aqueous solution or dispersion may further contain various additives. 所述添加剂优选不妨碍形成水凝胶的有效胶凝作用。 The additive is preferably not obstruct the effective hydrogel-forming gelling. 添加剂的用量取决于具体的应用，并且易于由本领域技术人员使用常规实验来确定。 The amount of additive depends on the particular application, and can readily be determined by those skilled in the art using routine experimentation. 例如，第一水溶液或分散体和第二水溶液或分散体可包含至少一种选自下列的添加剂：PH调节剂、粘度调节剂、抗氧化剂、稳定剂、抗微生物剂、着色剂、表面活性剂、提高或降低水凝胶组织粘合剂或密封剂降解速率的添加剂、药物和治疗剂。 For example, the first aqueous solution or dispersion and the second aqueous solution or dispersion may contain at least one additive selected from the group consisting of: PH adjusting agents, viscosity modifiers, antioxidants, stabilizers, antimicrobial agents, colorants, surfactants , increase or decrease the hydrogel tissue adhesive or sealant degradation rate additives, drugs and therapeutic agents. 所述第一水溶液或分散体和/或所述第二水溶液或分散体可任选包含至少一种PH调节剂以调节一种或多种溶液或一种或多种分散体的pH。 pH  and / or the second aqueous solution or dispersion of the first aqueous solution or dispersion may optionally comprise at least one PH adjusting agent to adjust one or more solutions or dispersions of one or more . 适宜的pH调节剂是本领域熟知的。 Suitable pH adjusting agents are well known in the art. PH调节剂可以为酸性或碱性化合物。 PH adjusting agent may be an acidic or basic compound. 酸性pH调节剂实例包括但不限于羧酸、无机酸、和磺酸。 Examples of acidic pH adjusting agents include but are not limited to, carboxylic acids, inorganic acids, and sulfonic acids. 碱性PH调节剂的实例包括但不限于氢氧化物、醇盐、羧酸盐、除了伯胺和仲胺以外的含氮化合物、和碱性碳酸盐和磷酸盐。 Examples of alkaline PH adjusting agents include, but are not limited to, hydroxide, alkoxides, carboxylates, in addition to primary and secondary amines, nitrogen-containing compounds, and basic carbonates and phosphates. 所述第一水溶液或分散体和/或所述第二水溶液或分散体可任选包含至少一种抗微生物剂。  and / or the second aqueous solution or dispersion of the first aqueous solution or dispersion may optionally comprise at least one antimicrobial agent. 适宜的抗微生物防腐剂是本领域熟知的。 Suitable antimicrobial preservatives are well known in the art. 适宜的抗微生物剂实例包括但不限于对羟基苯甲酸烷基酯如对羟基苯甲酸甲酯、对羟基苯甲酸乙酯、对羟基苯甲酸丙酯、和对羟基苯甲酸丁酯；三氯生；氯己定；甲酚；氯甲酚；对苯二酚；苯甲酸钠和苯甲酸钾；聚六亚甲基双胍；有效抗菌的抗生素，包括氨基糖苷抗生素如庆大霉素、链霉素、阿米卡星和卡那霉素，先锋霉素如头孢氨苄和头孢曲松钠，碳头孢烯如氯拉卡比，糖肽如万古霉素，大环内酯如红霉素和利福平，青霉素如阿莫西林和氨比西林，多肽如杆菌肽和多黏菌素B，喹诺酮如环丙沙星、左氧氟沙星和莫西沙星，四环素如土霉素和强力霉素，和磺胺；杀真菌剂如酮康唑、咪康唑和两性霉素B ；抗病毒素如无环鸟苷或AZT ；抗蠕虫剂；和抗原虫剂。 Examples of suitable antimicrobial agents include but are not limited to, alkyl parabens such as methylparaben, ethylparaben, propylparaben, and butylparaben; triclosan ; chlorhexidine; cresol; chloro-cresol; hydroquinone; sodium benzoate and potassium benzoate; polyhexamethylene biguanide; antibacterial effective antibiotics, such as gentamicin comprising aminoglycoside antibiotic, streptomycin, kanamycin and amikacin, ceftriaxone and cephalosporins such as cephalexin, carbacephems than La as chlorine, glycopeptides such as vancomycin, macrolides such as erythromycin and rifampicin , penicillins such as amoxicillin and ampicillin, polypeptides such as bacitracin and polymyxin B, quinolone such as ciprofloxacin, levofloxacin and moxifloxacin, such as tetracycline, oxytetracycline and doxycycline, and sulfonamide; fungicidally agents such as ketoconazole, miconazole, and amphotericin B; antivirals such as acyclovir or of AZT; anthelmintic agent; and antiprotozoal agents. 所述第一水溶液或分散体和/或所述第二水溶液或分散体可任选包含至少一种着色剂以增强一种或多种溶液或一种或多种分散体的可见性。  and / or the second aqueous solution or dispersion of the first aqueous solution or dispersion may optionally comprise at least one colorant to enhance one or more solutions or one or more dispersion visibility . 适宜的着色剂包括染料、颜料、和天然着色剂。 Suitable colorants include dyes, pigments, and natural colorants. 适宜的着色剂的实例包括但不限于FD&C和D&C着色剂，如FD&C紫2号、 FD&C蓝1号、D&C绿6号、D&C绿5号、D&C紫2号；和天然着色剂，如甜菜根红、角黄素、叶绿素、曙红、藏红、和胭脂红。 Examples of suitable colorants include, but are not limited to FD & C and D & C colorants, such as FD & C Violet No. 2, FD & C Blue No.. 1, D & C Green No.. 6, D & C Green No.. 5, D & C Violet No. 2; and natural colorants such as beetroot red, canthaxanthin, chlorophyll, eosin, saffron, and carmine. 所述第一水溶液或分散体和/或所述第二水溶液或分散体可任选包含至少一种表面活性剂。  and / or the second aqueous solution or dispersion of the first aqueous solution or dispersion may optionally comprise at least one surfactant. 如本文所用，表面活性剂是指降低水的表面张力的化合物。 As used herein, a surface active agent is a compound to reduce surface tension of water means. 所述表面活性剂可为离子表面活性剂诸如月桂基硫酸钠，或中性表面活性剂诸如聚氧乙烯醚、聚氧乙烯酯、 和聚氧乙烯脱水山梨糖醇。 The surfactant may be an ionic surfactant such as sodium lauryl sulfate, or neutral surfactants such as polyoxyethylene ethers, polyoxyethylene esters, polyoxyethylene sorbitan and sorbitol. 此外，所述第一水溶液或分散体和/或所述第二水溶液或分散体可任选包含至少一种药物或治疗剂。  In addition, the first aqueous solution or dispersion and / or the second aqueous solution or dispersion may optionally comprise at least one pharmaceutical or therapeutic agent. 适宜的药物和治疗剂是本领域熟知的（参见例如United States Pharmacopeia(USP) > Physician' s Desk Reference (Thomson Publishing)、The Merck Manual of Diagnosis and Therapy 第18 版（Mark H. Beers 禾口Robert Berkow (编辑）， Merck Publishing Group, 2006)；或就云力物而言，参见The Merck Veterinary Manual 第9 版（Kahn，C. Α. (编辑），Merck Publishing Group，2005)。非限制性实例包括抗炎剂例如糖皮质素如泼尼松、地塞米松、布德松；非留族抗炎剂如吲哚美辛、乙酰水杨酸、布洛芬、舒林酸、吡罗昔康、和萘普生；溶纤维蛋白剂如组织纤维蛋白溶酶原激活剂和链激酶；抗凝结剂如肝素、蛭素、蛇毒蛋白酶、血液凝固防止剂、醋硝香豆醇、伊洛前列素、L-精氨酸、双嘧达莫以及其它血小板功能性抑制剂；抗体；核酸；肽；激素；生长因子；细胞因子；趋化因子； 凝血因子；体内凝血抑制剂；抗菌剂；抗病 Suitable pharmaceutical and therapeutic agents are well known in the art (see, e.g. United States Pharmacopeia (USP)> Physician 's Desk Reference (Thomson Publishing), The Merck Manual of Diagnosis and Therapy, 18th Edition (Mark H. Beers Hekou Robert Berkow (editor), Merck Publishing Group, 2006); cloud or force it was concerned, see The Merck Veterinary Manual 9th ​​edition (. Kahn, C Α (edit. ), Merck Publishing Group, 2005) include non-limiting examples. antiinflammatory agents such as glucocorticoids such as prednisone, dexamethasone, budesonide; non-leaving group such as anti-inflammatory agents indomethacin, acetylsalicylic acid, ibuprofen, sulindac, piroxicam, and naphthyl Cape Health; fibrinolytic agents such as tissue plasminogen activator and streptokinase; anti-coagulant agents such as heparin, hirudin, snake venom proteases, blood coagulation preventing agent, acenocoumarol coumaryl alcohol, iloprost, L- arginine, dipyridamole and other platelet function inhibitors; antibody; a nucleic acid; peptide; hormone; growth factors; cytokines; chemokines; clotting factor; vivo coagulation inhibitor; antibacterial agents; antiviral 剂；抗真菌剂；抗癌剂；细胞黏附抑制剂；愈合促进剂；疫苗；血栓形成剂如凝血酶、纤维蛋白原、高半胱氨酸、和雌氮芥；不透辐射化合物如硫酸钡和金颗粒以及放射性同位素标记物。 Agents; antifungal agents; anticancer agents; cell adhesion inhibitors; healing promoting agents; vaccines; thrombotic agents such as thrombin, fibrinogen, homocysteine, and estramustine; radiopaque compound such as barium sulfate and gold particles and radioisotope labels. 胺如脱乙酰壳多糖、聚烯丙基胺和聚赖氨酸；以及二酰胼和聚酰胼如二（甲酰胼）聚醚和聚（甲酰胼）星形聚醚。 Amines such as chitosan, polyallylamine, and polylysine; and diacyl corpus corpus and polyamide such as di (formyl corpus) polyethers and poly (formyl corpus) star polyethers. 这些化合物中，有许多可从公司商购获得，诸如Sigma-Aldrich和Huntsman LLC。 Among these compounds, there are many commercially available from supplier companies, such as Sigma-Aldrich and Huntsman LLC. 通常，如果存在的话，所述多官能胺的使用浓度相对于水溶液或分散体中多臂胺的重量为约5重量％至约1000重量％。 Typically, if present, the concentration of the polyfunctional amine is often used with respect to the aqueous solution or dispersion of the multi-arm amine weight of about 5 wt% to about 1000% by weight. 当所述第一水溶液或分散体与所述第二水溶液或分散体混合时，它们反应形成交联的水凝胶，所述水凝胶包含至少一种含醛基的聚甘油醛；和至少一种水分散性多臂胺，其中至少三个壁以至少一个伯胺基封端，并且其中所述至少一种聚甘油醛和所述至少一种水分散性多臂胺通过在聚甘油醛的醛基与水分散性多臂胺的伯胺基之间形成的共价键交联。  When the first aqueous solution or dispersion and the second aqueous solution or dispersion is mixed, they react to form a crosslinked hydrogel, the hydrogel comprises at least one polyglycerol aldehyde-containing aldehyde ; and at least one water-dispersible multi-arm amine, wherein at least three walls at least one primary amine terminated, and wherein the at least one polyglycerol aldehyde and at least one water-dispersible multi-arm amine by covalent crosslinking between aldehyde and primary amine groups of the water-dispersible multi-arm amine polyglycerol aldehydes. 所述共价键可为亚胺键、缩醛胺键、或半缩醛胺键。 The covalent bond may be an imine, aminal bond, or hemiaminal key. 可使用所述第一水溶液或分散体和第二水溶液或分散体，以将涂层施用至活生物体组织上的解剖位点。  using the first aqueous solution or dispersion and the second aqueous solution or dispersion to the coating applied to an anatomical site on tissue of a living organism. 可以任何一种方式将两种水溶液或分散体施用到所述位点上。 Either way can be of two aqueous solutions or dispersions applied to the said site. 当两种溶液或分散体在位点上混合时，它们交联以形成在所述位点上提供涂层的水凝胶。 When two solutions or dispersions at positions on the mixing, they crosslink to form on the site to provide a hydrogel coating. 在一个实施方案中，可相继使用任何适宜的装置将两种水溶液或分散体施用到所述位点上，包括但不限于喷雾、用棉签或刷子涂抹、或使用吸移管或注射器压出。  In one embodiment, can be sequentially using any suitable means of two aqueous solutions or dispersions applied to the said site, including, but not limited to, spray, applied with a cotton swab or a brush, or the use of a pipette or syringe pressure out. 所述溶液或分散体可以任何顺序施用。 The solution or dispersion may be administered in any order. 接着使用任何适宜的装置诸如棉签、刮刀或吸移管或注射器的尖端，在所述位点上混合所述溶液或分散体。 Then using any suitable means such as a cotton swab, spatula or tip of a pipette or syringe, mixing the site on the solution or dispersion. 在另一个实施方案中，在施用到位点上前，先将两种水溶液或分散体手动混合。  In another embodiment, in place of administration point forward, first manually mixing the two aqueous solutions or dispersions. 然后在其完全固化之前，使用如上所述的适宜施用装置，将所得混合物施用到所述位点上。 Before it is then fully cured, using a suitable administration device as described above, and the resulting mixture is applied to the site. 在另一个实施方案中，将所述第一溶液或分散体和所述第二溶液或分散体同时施用到所述位点上，其中它们混合形成水凝胶。  In another embodiment, the first solution or dispersion and the second solution or dispersion simultaneously applied to the site where they are mixed to form a hydrogel. 例如，可将两种水溶液或分散体被包含在双筒注射器的单独筒中。 For example, the two aqueous solutions or dispersions are contained in a single double barrel syringe barrel. 这样，可用注射器同时将两种水溶液或分散体施用到所述位点上。 In this way, the syringe can be used while the two aqueous solutions or dispersions applied to the said site. 适宜的双筒注射器施用装置是本领域已知的。 Suitable double-barrel syringe applicator is known in the art. 例如，Redl在美国专利No. 6，620，125(尤其是图1、5和6，其描述于第4栏第10行至第6栏第47行中）中描述了若干适用于本发明中的施用装置。 For example, in U.S. Patent to Redl No. 6,620,125 (particularly FIGS. 5 and 6, which is described in column 4, line 47 through column 10, line 6) are described in a number suitable for use in the present invention, applicator. 此外，可使用双腔导管如得自Bistech Jnc. (ffoburn,MA)的那些，将两种水溶液或分散体施用到所述位点上。 Further, as may be available from the use of a double lumen catheter Bistech Jnc. (Ffoburn, MA), those of two aqueous solution or dispersion applied to the said site. 此外，将两种液体组分同时内镜引入到体内的注射装置是本领域已知的，并且可适用于本文所公开的两种水溶液或分散体的递送（参见例如Linder等人的美国专利No. 5，322，510)。 In addition, the two liquid components introduced into the body simultaneously endoscopic injection device known in the art, and is applicable to two aqueous solutions disclosed herein dispersions or delivery (see, e.g., Linder et al., U.S. Patent No . 5,322,510). 在另一个实施方案中，可使用包含静止混合器的双筒注射器如得自ConProtec， Inc. (Salem, NH)或Mixpac Systems AG (Rotkreuz, Switzerland)的那些，将所述第一溶液或分散体和所述第二溶液或分散体预混，并且递送至所述位点。 Double syringe  In another embodiment, the static mixer may be used, such as comprising from ConProtec, Inc. (Salem, NH), or Mixpac Systems AG (Rotkreuz, Switzerland) those of said first solution or dispersion and the second solution or dispersion premix, and delivery to the site. 作为另外一种选择，混合尖端可配备喷雾头，如Cruise等人在美国专利No. 6，458，147中描述的那些。 Alternatively, the mixing tip can be equipped with a spray head, such as Cruise et al., Those described in U.S. Patent No. 6,458,147. 此外，可使用导管或内窥镜，将得自双筒注射器的两种水溶液或分散体的混合物施用到所述位点。 Furthermore, using a catheter or an endoscope, a mixture of two or double syringe aqueous dispersion obtained from administration to the site. 用于混合两种液体组分组织粘合剂并且将所得混合物内镜递送的装置是本领域已知的， 并且适于混合和递送本文所公开的两种水溶液或分散体（参见例如Nielson的美国专利No. 6，723，067 ；和Redl 等人的美国专利No. 4，631，055)。 For mixing two liquid components tissue adhesive and the resulting mixture was endoscopic delivery device known in the art, and the two aqueous solutions or dispersions suitable for mixing and delivery are disclosed herein (see, e.g. U.S. Nielson Patent No. 6,723,067; and US Patent Redl et al. No. 4,631,055). 在另一个实施方案中，可使用喷雾装置如Fukimaga等人描述的那些（美国专利No. 5，582，596)、Delmotte等人描述的那些(美国专利No. 5，989，215)或Sawhney描述的那些（美国专利No. 6，179，86¾)，将两种水溶液或分散体施用至所述位点。 Those  In another embodiment, the spraying device may be used such as those described Fukimaga et al. (U.S. Pat. No. 5,582,596), Delmotte et described (U.S. Pat. No. 5,989,215) Sawhney or those described (U.S. Pat. No. 6,179,86¾), the two aqueous solutions or dispersion is applied to the site. 在另一个实施方案中，可使用微创性外科手术施用装置如Sawhney描述的那些(美国专利No. 7，347，850)，将两种水溶液或分散体施用至所述位点。  In another embodiment, using minimally invasive surgical devices such as those administered (U.S. Pat. No. 7,347,850), the two aqueous solutions or dispersions Sawhney administered to the site described. 在另一个实施方案中，使用本发明的水凝胶组织粘合剂，以将至少两个解剖位点粘合在一起。  In another embodiment, a hydrogel tissue adhesive of the invention, at least two anatomical sites together. 在此实施方案中，采用上述方法，将所述第一水溶液或分散体施用到至少一个解剖位点上，而将所述第二水溶液或分散体施用到至少一个相同解剖位点或另一个解剖位点上。 In this embodiment, the above-described method, the first aqueous solution or dispersion is applied to at least one anatomical site, and the second aqueous solution or dispersion is applied to at least one or the other of the same anatomical site anatomy on site. 可手工或使用某些其它装置诸如外科手术用夹具，使两个或更多个位点接触并且在一起保持足够的时间，以使所述混合物固化。 May be manually or using some other device such as a surgical clamp, the two or more sites in contact with and held for a time sufficient to cure the mixture. 作为另外一种选择，采用上述方法，将两种水溶液或分散体的混合物施用到至少一个待粘合的解剖位点上。 Alternatively, the above-described method, the mixture of two aqueous solutions or dispersions to be applied to at least one anatomical site of adhesion. 可手工或使用某些其它装置诸如外科手术用夹具，使两个或更多个位点接触并且在一起保持足够的时间，以使所述混合物固化。 May be manually or using some other device such as a surgical clamp, the two or more sites in contact with and held for a time sufficient to cure the mixture. 在另一个实施方案中，本文所公开的水凝胶组织粘合剂可以干燥水凝胶形式使用。  In another embodiment, the hydrogel tissue adhesive disclosed herein can be used in the form of dried hydrogel. 在该实施方案中，通过在溶剂中将至少一种聚甘油醛与至少一种水分散性多臂胺混合形成水凝胶，并且处理所述水凝胶以去除至少一部分溶剂形成干燥水凝胶，来制备干燥水凝胶。 In this embodiment, at least one polyglycerol aldehyde in a solvent is mixed with at least one water-dispersible multi-arm amine to form a hydrogel, the hydrogel and the process to remove at least a portion of the solvent to form a dried hydrogel , and dried to prepare a hydrogel. 适宜的溶剂包括但不限于水、乙醇、异丙醇、四氢呋喃、己烷、聚乙二醇、以及它们的混合物。 Suitable solvents include but are not limited to, water, ethanol, isopropanol, tetrahydrofuran, hexane, polyethylene glycols, and mixtures thereof. 如果使用两种不同的溶剂，则两种溶剂可彼此混溶。 If two different solvents, the two solvents are miscible with one another. 在一个实施方案中，所述溶剂为水。 In one embodiment, the solvent is water. 聚甘油醛和水分散性多臂胺可以多种方式混合。 Polyglycerol water-dispersible multi-arm aldehyde and amine may be combined in various ways. 例如，可如上所述制备包含聚甘油醛的第一水溶液或分散体和包含水分散性多臂胺的第二水溶液或分散体，并且混合，以形成水凝胶。 For example, polyglycerol may be prepared as described above comprise a first aldehyde aqueous solution or dispersion and the second aqueous solution comprising a water-dispersible multi-arm amine or dispersion, and mixed, to form a hydrogel. 根据预期应用，用于制备干燥水凝胶的溶液或分散体还可包含多种添加剂。 Depending on the intended application, for the preparation of dried hydrogel solution or dispersion may further contain various additives. 可使用上述任何添加剂。 Any of the above additives may be used. 然后处理所述水凝胶，以去除其中包含的至少一部分溶剂，形成干燥的水凝胶。 The hydrogel is then processed to remove at least a portion of the solvent contained therein, to form a dried hydrogel. 优选从所述水凝胶中移除基本上所有的溶剂。 Preferably remove substantially all solvent from the hydrogel. 可采用本领域已知的方法从所述水凝胶中移除溶剂，例如使用热、真空、热和真空的组合、或使干燥空气或干燥惰性气体如氮气的气流在水凝胶上方流动。 Methods known in the art may be employed to remove solvent from the hydrogel, for example, heat, vacuum, heat and vacuum combination, or dry air or a dry inert gas such as nitrogen gas stream flowing over the hydrogel. 可采用上述方法，将干燥的水凝胶消毒。 The method described above may be employed, the dried hydrogel is sterilized. 可以下述许多方式， 将干燥的水凝胶施用到解剖位点上。 The following may be a number of ways, the dried hydrogel is applied to an anatomical site. 可通过加入适宜的水溶液如水或缓冲液（例如磷酸盐缓冲的盐溶液）或通过所述位点上存在的生理流体，使干燥的水凝胶在所述位点上水合。 By the addition of water or a suitable aqueous buffer (such as phosphate buffered saline solution), or by the presence of physiological fluid on the site, the dried hydrogel is hydrated on the site. 在一个实施方案中，干燥的水凝胶可以膜形式使用。  In one embodiment, the dried hydrogel may be used in the form of a film. 干燥的水凝胶膜可通过将溶液或分散体混合物浇铸在适宜的基底上，并且处理所得水凝胶形成干燥的水凝胶膜而形成。 The dried hydrogel films can be prepared by solution or dispersion casting the mixture on a suitable substrate, and treating the resulting dried hydrogel forming the hydrogel films. 干燥的水凝胶膜可直接施用到解剖位点。 The dried hydrogel film can be applied directly to the anatomical site. 此外，干燥的水凝胶膜可用于将两个解剖位点粘合在一起。 Further, the dried hydrogel film may be used to bond together two anatomical sites. 在另一个实施方案中，干燥的水凝胶可以细分颗粒形式使用。  In another embodiment, the dried hydrogel may be used in the form of finely divided particles. 干燥的水凝胶颗粒可经由本领域已知的方法，粉碎所述干燥水凝胶而形成，所述方法包括但不限于用研钵和研杵碾磨、粉碎、或压碎。 The hydrogel particles may be dried by methods known in the art, pulverizing the dried hydrogel is formed, including but not limited to, using mortar and pestle milling, grinding, or crushing. 干燥的水凝胶颗粒可以多种方式如淋洒或喷雾施用到解剖位点上，并且也可用于将两个解剖位点粘合在一起。 The hydrogel particles may be dried in various ways, such as shower or spray applied to the anatomical site, and may also be used to bond together two anatomical sites. 在一个实施方案中，本发明提供了试剂盒，所述试剂盒包含至少一种聚甘油醛和至少一种水分散性多臂胺，其中至少三个臂被至少一个伯胺基封端。  In one embodiment, the present invention provides a kit, said kit comprising at least one polyglycerol aldehyde and at least one water-dispersible multi-arm amine, wherein the at least three arms of at least one primary amine group is end. 在另一个实施方案中，所述试剂盒包含第一水溶液或分散体和第二水溶液或分散体，所述第一水溶液或分散体包含至少一种聚甘油醛，所述第二水溶液或分散体包含至少一种水分散性多臂胺。  In another embodiment, the kit comprises a first aqueous solution or dispersion and the second aqueous solution or dispersion, the first aqueous solution or dispersion comprising at least one polyglycerol aldehyde, the second aqueous solution or dispersion comprising at least one water-dispersible multi-arm amine. 每一种水溶液或分散体均可被包含在任何适宜的容器中，诸如小瓶或注射器圆筒。 Each of aqueous solutions or dispersions may be contained in any suitable container, such as a vial or syringe barrel. 在另一个实施方案中，所述试剂盒包含如上所述的干燥水凝胶。  In another embodiment, the kit comprises dried hydrogel described above. 干燥的水凝胶可为膜、细分颗粒形式、或其它干燥形式。 The dried hydrogel may be a film, in the form of finely divided particles, or other dry form. 所述试剂盒可进一步包含用于水化干燥水凝胶的水溶液。 The kit may further comprise drying an aqueous solution of a hydrated hydrogel. 干燥的水凝胶颗粒可被包含在任何适宜的容器中。 The dried hydrogel particles may be contained in any suitable container. 本文所公开的组织粘合剂和密封剂可用于医学和兽医学应用，包括但不限于闭合伤口、补充或替代体内手术操作如肠吻合术和血管吻合术中的缝合线或卡钉、组织修复、防止流体如血液、胆汁、胃肠液和脑脊液渗漏、眼科手术、药物递送、以及防止术后粘连。  as disclosed herein, tissue adhesives and sealants can be used for medical and veterinary applications, including but not limited to wound closure, to supplement or replace sutures in vivo surgical procedure such as intestinal anastomosis and vascular anastomosis staple or , tissue repair, prevent fluids such as blood, bile, gastrointestinal fluid and cerebrospinal fluid leakage, eye surgery, drug delivery, and the prevention of postoperative adhesions. 在这些应用中，可采用如上方法，将聚甘油醛和水分散性多臂胺或干燥水凝胶施用到所期望的解剖位点上。 In these applications, the above method may be employed, polyglycerol aldehyde and amine or water-dispersible, multi dried hydrogel applied to the desired anatomical site. 本发明将在下面的实施例中得到进一步阐述。  The present invention will be further illustrated in the following examples. 应当理解，尽管这些实施例说明了本发明的优选实施方案，但仅是以例证的方式给出的。 It should be understood that, although these examples illustrate preferred embodiments of the present invention, are given by way of illustration only of. 通过上述论述和这些实施例，本领域的技术人员可确定本发明的必要特征，并且在不脱离本发明的实质和范围的前提下，可对本发明进行各种变化和修改以适应多种用途和条件。 From the above discussion and these Examples, one skilled in the art can ascertain the essential characteristics of the present invention, and without departing from the spirit and scope of the present invention, can make various changes and modifications of the invention to adapt it to various uses and condition. 通过用偏高碘钠氧化葡聚糖水溶液，制备葡聚糖醛。  aqueous solution, prepared by dextran aldehyde with sodium metaperiodate oxidation of dextran. 根据Cohen等人所述方法（共同未决并且共同拥有的国际专利申请公布No. WO 2008/133847)，由具有8，500至11，500道尔顿重均分子量的葡聚糖（Sigma)制备D10-50，其是氧化葡聚糖，具有约10，OOODa的平均分子量和约50%的氧化转化率（即葡聚糖聚合物中约一半的葡萄糖环被氧化成二醛），以及约150的每醛基当量（EW)。 According to the method of Cohen et al., 8,500 to 11,500 daltons having a weight average molecular weight dextran (Sigma) was prepared (copending and commonly owned International Patent Application Publication No. WO 2008/133847) D10-50, which is oxidized dextran having about 10, the conversion rate of the oxidation OOODa average molecular weight of about 50% (i.e., about half of the dextran polymer glucose ring is oxidized to a dialdehyde), and about 150 each aldehyde group equivalent (EW). 此处描述了典型的方法。 Typical methods are described herein. 向配备有机械搅拌器、加料漏斗、内部温度探针、和氮气扫气的20L反应器中，加入IOOOg葡聚糖和9. OOL去离子水。  equipped with a mechanical stirrer, addition funnel, internal temperature probe, and nitrogen purge 20L reactor was charged IOOOg dextran and 9. OOL deionized water. 将混合物在环境温度下搅拌以溶解葡聚糖，然后冷却至10至15°C。 The mixture was stirred at ambient temperature to dissolve the dextran and then cooled to 10 to 15 ° C. 在一小时期间内，向冷却的葡聚糖溶液中加入IOOOg溶于9. OOL去离子水中的高碘酸钠的溶液，同时保持反应温度低于25°C。 Over a period of one hour, was added to the dextran solution cooled IOOOg 9. OOL dissolved in deionized water, sodium periodate, while maintaining the reaction temperature below 25 ° C. 在已经加入所有高碘酸钠溶液之后，将混合物在20至25°C下再搅拌4小时。 After the addition of all the sodium periodate has been added and the mixture was stirred at 20 to 25 ° C 4 hours. 然后将反应混合物冷却至0°C，并且过滤使其澄清。 The reaction mixture was cooled to 0 ° C, clarified and filtered. 将氯化钙（500g)加入到滤液中，并且将混合物在环境温度下搅拌30分钟，然后过滤。 Calcium chloride (500 g of) was added to the filtrate, and the mixture was stirred at ambient temperature for 30 minutes and then filtered. 将碘化钾GOOg)加入到滤液中，并且将混合物在环境温度下搅拌30分钟。 Goog potassium iodide) were added to the filtrate, and the mixture was stirred at ambient temperature for 30 minutes. 在10至15分钟期间内，将3L份的所得红色溶液加入到9. OL丙酮中，同时在加入期间用机械搅拌器剧烈搅拌。 During 10 to 15 minutes the resulting red 3L parts 9. OL solution was added to acetone, with vigorous stirring during the addition with a mechanical stirrer. 再搅拌若干分钟后，结块产物与上清液分离。 After stirring for several minutes, the supernatant separated agglomerated product. 以与上述相同的方式处理将碘化钾加入到第二滤液中所获得的剩余红色溶液。 Processed in the same manner as described above to a solution of potassium iodide was added to the remaining second red filtrate obtained. 使合并的结块产物破碎，在不锈钢大混碎机中与2L甲醇混合并且共混，直至固体变成颗粒状。 The combined product was crushed agglomerates, mixed and blended with 2L of methanol and mixed in a large stainless steel mill until the solid to a particulate. 通过过滤回收颗粒状固体，并且在氮气扫气下，真空干燥。 Particulate solids recovered by filtration, under nitrogen purge and vacuum dried. 然后将颗粒状固体锤磨成细粉。 The hammer is then finely divided particulate solid. 向20L反应器中加入10.8L去离子水和7.2L甲醇， 并且将混合物冷却至0°C。 Was added to the 20L reactor 10.8L deionized water and 7.2L of methanol, and the mixture was cooled to 0 ° C. 将由前一步形成的颗粒加入到反应器中，并且将浆液剧烈搅拌一小时。 Before the particles formed by step added to the reactor, and the slurry was stirred vigorously for one hour. 停止搅拌，并且使固体沉降到反应器底部。 Stirring was stopped, and the solids settle to the bottom of the reactor. 真空滗析出上清液，将15L甲醇加入到反应器中，并且将浆液搅拌30至45min，同时冷却至0°C。 Decant the supernatant in vacuo, methanol was added to the 15L reactor and the slurry was stirred to 30 for 45 min, while cooling to 0 ° C. 将浆液分份过滤，并且用甲醇洗涤回收的固体，合并并且在氮气扫气下真空干燥，获得约600g氧化葡聚糖，其在本文中被称为D10-50。 The slurry was filtered in portions, and the recovered solid was washed with methanol, combined and dried under vacuum in scavenging nitrogen, oxidized dextran of about 600g, which is referred to herein as D10-50. 由质子NMR测定产物的氧化度，为约50% (每个醛基当量=150)。  The product proton NMR measured by the degree of oxidation from about 50% (per aldehyde group equivalents = 150). 在NMR方法中， 测定两个范围内峰的积分，具体地讲，约6. 2份每百万份（ppm))至约4. 15ppm处（去除HOD 峰）的-O2CHx-,和约4. 15ppm至约2. 8ppm处（去除任何甲醇峰，如果存在的话）的-OCHx-。 In the NMR method, the measurement range of the integral in two peaks, in particular, from about 6.2 parts) at about 4. 15ppm (ppm) (removal HOD peak) -O2CHx- parts per million, and about 4. at 15ppm to about 2. 8ppm (to remove any methanol peak, if present) of -OCHx-. 氧化度计算基于这些面积的计算比率（R)，具体地讲，R = (OCH)/(O2CH)，即 The degree of oxidation is calculated based on calculating a ratio (R) of these areas, in particular, R = (OCH) / (O2CH), i.e. 每醛基EW。 Each aldehyde group EW. 采用由Chenault在共同未决并且共同拥有的美国专利申请公布No. 2007/0249870中所述的两步方法，合成八臂PEG IOK八胺（Mn = IOkDa)。  employed by the Chenault copending and commonly owned U.S. Patent Application Publication No. 2007/0249870 in the two-step method of synthesis of eight-arm PEG IOK octaamine (Mn = IOkDa). 在第一步中， 通过亚硫酰氯与8臂PEG IOK八醇的反应制得8臂PEG IOK八氯化物。 In a first step, by thionyl chloride and reaction of 8-arm PEG IOK eight alcohols have eight 8-arm PEG IOK chloride. 在第二步中，使8 臂PEG IOK八氯化物与氨水反应获得8臂PEG IOK八胺。 In the second step, eight 8-arm PEG IOK chloride with aqueous ammonia to obtain 8-arm PEG IOK octaamine. 此处描述了典型的方法。 Typical methods are described herein. 在配备有搅拌器、回流冷凝器和蒸馏头的4L玻璃反应容器，在氮气氛下将8臂PEG IOK 八醇(Mn = 10000 ；SunBright HGE0-10000 ；NOF Corp.，IOOOg)溶于1. 5L 甲苯中。  equipped with a stirrer, reflux condenser and distillation head 4L glass reaction vessel, under a nitrogen atmosphere, 8-arm PEG IOK octol (Mn = 10000; SunBright HGE0-10000; NOF Corp., IOOOg) was dissolved 1. 5L toluene. 通过减压下（13kPa，罐温65°C )蒸馏移除约500mL甲苯，将混合物共沸干燥。 (13kPa, pot temperature 65 ° C) to about 500mL toluene was removed by distillation under reduced pressure, and the mixture was azeotropically dried. 用氮气使混合物回至大气压，并且在10分钟内将亚硫酰氯Q33mL)加入到混合物中，使罐温保持低于85 °C。 The mixture was refluxed with nitrogen to atmospheric pressure, and over 10 minutes thionyl chloride Q33mL) added to the mixture, so that the pot temperature was kept below 85 ° C. 在亚硫酰氯加料完成后，将混合物加热至85 °C，并且在85 °C下搅拌4h。 After the thionyl chloride addition was complete, the mixture was heated to 85 ° C, and stirred at 85 ° C 4h. 通过真空蒸馏QkPa，罐温40-60°C )移除过量的亚硫酰氯和大部分甲苯。 By vacuum distillation to remove the excess QkPa, pot temperature 40-60 ° C) of thionyl chloride and most of the toluene. 相继加入两份500mL甲苯， 并且减压蒸发OkPa，浴温为60°C)以完全除去亚硫酰氯。 Two successively added 500mL of toluene and evaporated under reduced pressure OkPa, a bath temperature of 60 ° C) to completely remove the thionyl chloride. 将压力降至0.7-0. 9kPa，并且在85°C罐温下持续蒸馏60-90分钟以完全移除甲苯。 The pressure was reduced to 0.7-0. 9kPa, and distillation continued for 60-90 minutes to completely remove the toluene at 85 ° C pot temperature. 得自一次合成的质子NMR结果为=1H NMR(500MHz, DMS0-d6) δ 3. 71-3. 69 (m, 16H)，3· 67-3. 65 (m, 16Η)，3· 50(s，〜800Η)。 Obtained from a synthesis result of proton NMR = 1H NMR (500MHz, DMS0-d6) δ 3. 71-3. 69 (m, 16H), 3 · 67-3. 65 (m, 16Η), 3 · 50 ( s, ~800Η). 在产物仍然温热时，将其溶于IL去离子水中，并且从反应容器中放出。 When still warm product, which was dissolved in IL of deionized water, and discharged from the reaction vessel. 在配备有搅拌器的5加仑不锈钢压力容器中，将如上制得的8臂PEG IOK八氯化物的水溶液与16L浓氨水)混合，并且用氮气置换空气。  equipped with a stirrer 5-gallon stainless steel pressure vessel, the above prepared 8-arm PEG IOK eight 16L chloride and concentrated aqueous ammonia solution) were mixed, and the air was replaced by nitrogen. 将容器密闭，并且将混合物在60°C下加热48小时。 The vessel was sealed and the mixture was heated at 60 ° C 48 h. 将混合物冷却至40°C，并且用干燥氮气进行氮气（2L/min)吹扫18-¾小时，以驱除氨。 The mixture was cooled to 40 ° C, and nitrogen (2L / min) with dry nitrogen purged 18-¾ hours to drive off ammonia. 停止氮气流，并且将混合物在40°C下真空QkPa)搅拌2小时。 Nitrogen flow was stopped, and the mixture was stirred at 40 ° C under vacuum QkPa) 2 hours. 使剩余的溶液通过以氢氧化物形式填塞于长30英寸、外径X6英尺柱中的5. Okg强碱性阴离子交换树脂（Purolite®A-860，The Purolite Co.，Bala-Cynwyd，PA)。 The remaining solution was packed in the hydroxide form by 30 inches long, an outer diameter of the column foot X6 5. Okg strongly basic anion exchange resin (Purolite®A-860, The Purolite Co., Bala-Cynwyd, PA) . 收集洗脱剂，并且使两份7L去离子水通过所述柱，并且同样收集起来。 Eluant was collected, and the two 7L deionized water through the column, and also collected. 将水溶液合并，减压OkPa，浴温为60°C)浓缩，然后在60°C /0. 3kPa下进一步干燥，获得约900-950g无色蜡质固体状8臂PEG IOK 八胺，其在本文中被称为P8-10-1。 The combined aqueous solution under reduced pressure OkPa, a bath temperature of 60 ° C) was concentrated, and then further dried at 60 ° C / 0. 3kPa, about 900-950g obtained as a colorless waxy solid 8-arm PEG IOK octaamine, which It referred to herein as P8-10-1. 采用由Arthur等人在共同未决和共同拥有的专利申请公布No. WO 2008/066787 中所述的两步方法，合成八臂PEG IOK十六胺（Mn = IOkDa,每聚合物分子平均16个伯胺基）。  Arthur et al., Using the in copending and commonly owned patent application Publication No. WO 2008/066787 in the two-step method of synthesis of eight-arm PEG IOK Hexadecaamine (Mn = IOkDa, per polymer molecule 16 primary amine groups on average). 在第一步中，通过在三乙胺的存在下使8臂PEG IOK八醇与甲磺酰氯反应，制得8臂PEG IOK八甲磺酸酯。 In a first step, by making eight 8-arm PEG IOK alcohol with methanesulfonyl chloride in the presence of triethylamine, to obtain 8-arm PEG IOK eight a sulfonate. 在第二步中，使8臂PEG IOK八甲磺酸酯在水中与三（2-氨乙基）胺反应，获得8臂PEG IOK十六胺。 In the second step, 8-arm PEG IOK bajia amine sulfonate in water with tris (2-aminoethyl) to give 8-arm PEG IOK hexadecaamine. 此处描述了典型的方法。 Typical methods are described herein. 在氮气氛下，将三乙胺（8. 8mL)加入到40g 8臂PEG IOK八醇（Mn = 10000 ； SunBright HGE0-10000 ；NOF Corp.)的200mL CH2Cl2溶液中。  Under a nitrogen atmosphere, triethylamine (8. 8mL) was added to 40g 8 arm PEG IOK octol (Mn = 10000; SunBright HGE0-10000; NOF Corp.) in 200mL CH2Cl2 solution. 在冰-水浴中使混合物冷却， 并且搅拌。 The mixture was cooled-water bath, and stirred - in ice. 在0°C下将甲磺酰氯G.8mL)滴加到搅拌过的反应混合物中（注意：放热）。 Methanesulfonyl chloride G.8mL) was added dropwise with stirring at 0 ° C for over the reaction mixture (NOTE: exotherm). 当甲磺酰氯加料完成后，移除冰-水浴，并且将反应在室温下搅拌过夜。 After completion of the addition of methanesulfonyl chloride, to remove the ice - water bath, and the reaction was stirred at room temperature overnight. 通过旋转蒸发将反应体积减至80mL，并且转移到分液漏斗中，其中用60mL 1. OM磷酸二氢钾水溶液温和洗涤三次，用60mL IM碳酸钾水溶液洗涤一次，并且用60mL水洗涤一次。 By rotary evaporation and the reaction volume was reduced to 80 mL, and transferred to a separatory funnel with 60mL 1. OM wherein the aqueous solution was washed three times with mild potassium dihydrogenphosphate, once with 60mL the IM aqueous potassium carbonate solution, and once with 60mL of water. 将CH2Cl2层在MgSO4上干燥，过滤，并且旋转蒸发浓缩，获得浆液。 The CH2Cl2 layer was dried over MgSO4, filtered, and concentrated by rotary evaporation to give a slurry. 收率85-90%。 Yield 85-90%. 将30g 8臂PEG IOK八甲磺酸酯的149mL水溶液加入到149mL三（2-氨乙基）胺的149mL水溶液中，并且将混合物在室温下搅拌过夜。  A 149mL aqueous solution of 30g 8 arm PEG IOK bajia sulfonate aqueous solution was added to three 149mL (2-aminoethyl) amine 149mL, and the mixture was stirred overnight at room temperature. 将碳酸氢钠水溶液（10衬％，1501^) 加入到反应混合物中，然后用ISOmL份的CH2ClJf其萃取三次。 The (% liner 10, 1501 ^) aqueous sodium bicarbonate was added to the reaction mixture, followed by its ISOmL parts CH2ClJf extracted three times. 使合并的有机层在MgSO4 上干燥、过滤，并且旋转蒸发浓缩。 The combined organic layer was dried over MgSO4, filtered, and concentrated by rotary evaporation. 使所得无色浆液在500mL醚中沉淀，并且在冰浴中冷却。 The resulting colorless slurry was precipitated in 500mL ether, and cooled in an ice bath. 通过过滤收集白色固体，并且在高真空下干燥过夜。 White solid was collected by filtration, and dried overnight under high vacuum. 收率90%。 90% yield. 8臂PEG IOK十六胺产物在本文中被称为P8-10-2。 8-arm PEG IOK Hexadecaamine products called P8-10-2 herein. 将1.90g高碘酸钠的15mL水溶液加入到1. 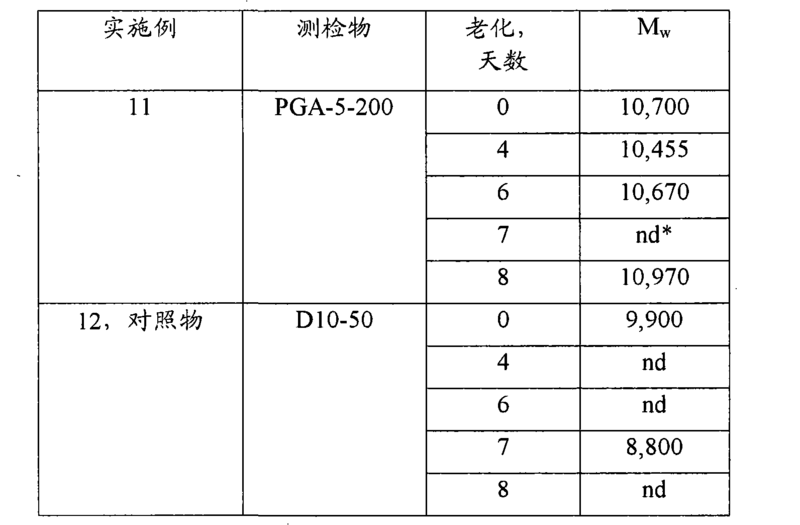 OOg聚甘油PG-500 (Hyperpolymers GmbH, Freiburg, Germany)的15mL水溶液中，足够缓慢以保持反应温度不升至30°C以上。  15mL of an aqueous solution of 1.90g of sodium periodate was added to an aqueous solution of PG-500 (Hyperpolymers GmbH, Freiburg, Germany) in 15mL 1. OOg polyglycerol, sufficiently slow to maintain the reaction temperature did not rise above 30 ° C. 加料完成后，使混合物在环境温度下搅拌2小时，然后倒入到75mL甲醇中。 After the addition was complete, the mixture was stirred at ambient temperature for 2 hours and then poured into 75mL of methanol. 通过过滤移出沉淀出的盐后，将滤液减压蒸发，获得聚甘油醛产物，使用屮NMR(500MHz,甲醇_d4)来表征它。 By After removing precipitated salts by filtration, the filtrate was evaporated under reduced pressure, to obtain polyglycerol aldehyde product, (500 MHz, methanol _d4) to characterize it uses Che NMR. 该实施例的目的在于制备具有约1，OOODa平均分子量的聚甘油醛。  The object of embodiments is to produce about 1, OOODa glyceraldehyde average molecular weight polyethylene. 通过使用高碘酸钠氧化具有约1，OOODa平均分子量和约48%支化度的聚甘油来制备聚甘油醛。 By using sodium periodate oxidation of about 1, OOODa average molecular degree of branching of about 48% polyglycerol poly-glyceraldehyde was prepared. 采用由A.Sunder 等人(“Macromolecules，，，32 :4240_4246，1999)描述的13C NMR 波谱方法，测定原料聚甘油1000的支化度。 Using a A.Sunder et al ( "Macromolecules ,,, 32: 4240_4246,1999) 13C NMR spectroscopic methods described herein, determining the branching of the raw material polyglycerol 1000. 将2. 52g高碘酸钠的20mL水溶液加入到2. 09g聚甘油1000的IOmL水溶液中，足够缓慢以保持反应温度不升至30°C以上。  20mL of an aqueous solution of 2. 52g of sodium periodate was added to an aqueous solution of 2. 09g polyglycerol IOmL 1000, sufficiently slow to maintain the reaction temperature did not rise above 30 ° C. 加料完成后，使混合物在环境温度下搅拌2小时， 冷却至0°C并且过滤移除固体。 After the addition was complete, the mixture was stirred for 2 hours at ambient temperature, cooled to 0 ° C and filtered to remove solids. 将二水合氯化钙（0. 67g)加入到滤液中，将其搅拌30分钟， 然后过滤移除固体，获得第二滤液。 The calcium chloride dihydrate (0. 67g) was added to the filtrate, stirred for 30 minutes and then filtered to remove the solid, the second filtrate. 向第二滤液中加入0.5mL乙酸和3.4g碘化钾。 0.5mL of acetic acid and 3.4g of potassium iodide were added to the second filtrate. 将混合物搅拌1小时，用90mL丙酮稀释，并且过滤移除沉淀出的聚合物。 The mixture was stirred for 1 hour, diluted with 90mL of acetone and filtered to remove the precipitated polymer. 分批用共250mL的丙酮洗涤所述聚合物，以去除碘的棕色。 Washed batchwise with a total of 250mL of acetone and the polymer to remove the brown iodine. 将聚合物溶于甲醇中，过滤溶液，然后减压蒸发，接着将残余物真空干燥。 The polymer was dissolved in methanol, the solution was filtered, then evaporated under reduced pressure, then the residue was dried in vacuo. 聚甘油醛产物的产量为1. 157g(68% )。 Yield of aldehyde product polyglycerol 1. 157g (68%). 采用ΐ NMR(500MHz, D2O)表征聚甘油醛产物。 Characterization of the polyglycerol aldehyde product employed ΐ NMR (500MHz, D2O). 该实施例的目的在于制备具有约2，OOODa平均分子量的聚甘油醛。  The object of embodiments is to produce about 2, OOODa glyceraldehyde average molecular weight polyethylene. 通过使用高碘酸钠氧化具有约2，OOODa平均分子量和约51 %支化度的聚甘油来制备聚甘油醛。 By using sodium periodate oxidation of about 2, OOODa average molecular weight of from about 51% degree of branching polyglycerol poly-glyceraldehyde was prepared. 采用由A. Sunder 等人（“Macromolecules”，32 :4240-4246,1999)描述的13C NMR 波谱方法，测定原料聚甘油2000的支化度，并且还由如上所述的其数均分子量（Mn)和其每末端二醇部分当量计算出原料聚甘油2000的支化度。 Using the A. Sunder, et al. ( "Macromolecules", 32: 4240-4246,1999) 13C NMR spectroscopic methods described, was a raw polyglycerin degree of branching 2000, and also a number of above-average molecular weight (Mn ) and each of the end portions of glycol equivalents calculated degree of branching feed polyglycerol 2000. 两种方法获得类似的结果。 Both methods achieve similar results. 将21. 20g NaIO4的193mL水溶液加入到溶于86mL水的21. 95g聚甘油2000 (Hyperpolymers GmbH)溶液中，足够缓慢以保持反应温度不升至30°C以上。  A 193mL aqueous solution of 21. 20g NaIO4 dissolved in 86mL of water was added to 21. 95g of polyglycerol 2000 (Hyperpolymers GmbH) was slowly enough to maintain the reaction temperature did not rise above 30 ° C. 加料完成后，将混合物在环境温度下搅拌半小时。 After the addition was complete, the mixture was stirred at ambient temperature for half an hour. 根据Belcher等人的方法（“Analytica Chimica Acta",41 :395-397,1968)，对反应混合物等分试样滴定碘酸盐和残余的高碘酸盐，表明97. 5%的高碘酸盐已被消耗，并且转化成碘酸盐。 According to Belcher et al. ( "Analytica Chimica Acta", 41: 395-397,1968), an aliquot of the reaction mixture and iodate titration of the residual periodate, showed 97.5% of periodic acid salt had been consumed and converted to iodide. 将反应溶液相对于6、7L份的去离子水透析（Spectrum Spectrapor 6 管材，MWCO 1，000)2. 5 天，直至用2mL 2. IM pH 2. 0 的氯乙酸盐缓冲液、一撮碘化钾和6滴1 %淀粉处理ImL渗析液等分试样，没有显示颜色。 The reaction solution with respect to 6,7L parts of deionized water, dialyzed (Spectrum Spectrapor 6 tubing, MWCO 1,000) 2. 5 days until use chloroacetate 2mL 2. IM pH 2.0 buffer, the pinch of potassium iodide and 6 drops of 1% starch processing ImL aliquot dialysate, no color display. 将渗析管材中的溶液冷冻并且冻干，获得聚甘油醛MW 2，000，采用屮NMR(500MHz, D2O)将其表征。 The dialyzed solution was freeze tubing and lyophilized to obtain poly glyceraldehyde MW 2,000, which was characterized using Che NMR (500MHz, D2O). 该实施例的目的在于制备具有约5，OOODa平均分子量和约200Da每醛基当量的聚甘油醛。  The object of the embodiment is that prepared having about 5, OOODa average molecular weight from about 200Da aldehyde group per equivalent of aldehyde polyglycerol. 通过使用高碘酸钠氧化具有约5，OOODa平均分子量和约60%支化度的聚甘油，并且通过渗析纯化，来制备聚甘油醛，即 By using sodium periodate oxidation of about 5, OOODa mean molecular weight and about 60% branching degree of polyglycerol, purified and analyzed by infiltration to prepare poly glyceraldehyde, i.e. 算其支化度。 Operator its degree of branching. 将11. 52g NaIO4的50mL水溶液加入到溶于30mL水的10. 06g聚甘油5000 (Hyperpolymers GmbH)溶液中，足够缓慢以保持反应温度不升至30°C以上。  The aqueous 50mL 11. 52g NaIO4 dissolved in 30mL of water was added to 10. 06g polyglycerol 5000 (Hyperpolymers GmbH) was slowly enough to maintain the reaction temperature did not rise above 30 ° C. 加料完成后，将混合物在环境温度下搅拌1小时。 After the addition was complete, the mixture was stirred at ambient temperature for 1 hour. 根据上述Belcher等人的方法，对反应混合物等分试样滴定碘酸盐和残余的高碘酸盐，表明74. 9%的高碘酸盐已被消耗，并且转化成碘酸盐。 Belcher et al., According to the above method, an aliquot of the reaction mixture and iodate titration of the residual periodate, showed 74.9% of the periodate has been consumed and converted to iodide. 将反应溶液相对于6、7L份的去离子水透析（Visking Membra-Cel 3500/4, MWCO 3，500)2. 5天，直至用2mL 2. IM pH 2. 0的氯乙酸盐缓冲液、一撮碘化钾和6滴淀粉处理ImL渗析液等分试样，没有显示颜色。 The reaction solution with respect to 6,7L parts of deionized water, dialyzed (Visking Membra-Cel 3500/4, MWCO 3,500) 2. 5 days until use 2mL 2. IM pH 2.0 buffer acid salt of , a pinch of potassium iodide and 6 drops of starch processing ImL aliquot dialysate, no color display. 将渗析管材中的溶液冷冻并且冻干，获得4. 89g聚甘油酸MW 5, 000, Eff 200，本文中将其称为PGA-5-200。 The dialyzed solution was freeze tubing and lyophilized to yield 4. 89g polyglycerol acid MW 5, 000, Eff 200, referred to herein as PGA-5-200. 尺寸排阻色谱法和多角度光散射检测（SEC-MALS)[流动相PBS(10mM磷酸盐， 2. 7mM KCl,0. 137M NaCl, pH 7. 4) ,0. 5mL/min,两根TSKgel GMPffXL 混合床柱（T0S0H Bioscience LLC, Montgomeryville, PA)，柱温30°C，dn/dc 0. 124mL/g]获得Mn 5, 000, Mw 10，700 以及Mw/Mn 2. 1。  and size exclusion chromatography multi-angle light scattering detection (SEC-MALS) [Mobile phase PBS (10mM phosphate, 2. 7mM KCl, 0. 137M NaCl, pH 7. 4), 0. 5mL / min, two TSKgel GMPffXL mixed bed columns (T0S0H Bioscience LLC, Montgomeryville, PA), column temperature 30 ° C, dn / dc 0. 124mL / g] obtained Mn 5, 000, Mw 10,700 and Mw / Mn 2. 1. 采用1H NMR(500MHz, D2O)表征聚甘油醛。 Characterization of the polyglycerol aldehyde using 1H NMR (500MHz, D2O). 该实施例的目的在于制备具有约5，OOODa平均分子量和约400Da每醛基当量的聚甘油醛。  The object of the embodiment is that prepared having about 5, OOODa average molecular weight from about 400Da aldehyde group per equivalent of aldehyde polyglycerol. 通过使用高碘酸钠氧化具有约5，OOODa平均分子量和约60%支化度的聚甘油来制备聚甘油醛。 By using sodium periodate oxidation of about 5, OOODa average molecular degree of branching of about 60% polyglycerol poly-glyceraldehyde was prepared. 由如上所述的原料聚甘油5000的数均分子量（Mn)和其每末端二醇部分当量，计算其支化度。 Polyglycerol 5000 by the number average molecular weight as described above starting material (Mn) and each of the end portions diol equivalents, calculated degree of branching. 将5. 40g NaIO4的31mL水溶液加入到溶于30mL水的10. 92g聚甘油5000 (Hyperpolymers GmbH)溶液中，足够缓慢以保持反应温度不升至30°C以上。  A 31mL aqueous solution 5. 40g NaIO4 dissolved in 30mL of water was added to 10. 92g of polyglycerol 5000 (Hyperpolymers GmbH) was slowly enough to maintain the reaction temperature did not rise above 30 ° C. 加料完成后，将混合物在环境温度下搅拌半小时，然后相对于7、7L份的去离子水透析（Visking Membra-Cel 3500/4, MWCO 3，500) 2. 8 天，直至用2mL 2. IM pH 2. 0 的氯乙酸盐缓冲液、一撮碘化钾和6滴1 %淀粉处理ImL渗析液等分试样，没有显示颜色。 After the addition was complete, the mixture was stirred at ambient temperature for half an hour, and then with respect to 7,7L parts of deionized water, dialyzed (Visking Membra-Cel 3500/4, MWCO 3,500) 2. 8 days before with 2mL 2. chloroacetate IM pH 2.0 buffer, and a pinch of potassium iodide and 6 drops of 1% starch processing ImL aliquot dialysate, no color display. 将渗析管材中的溶液冷冻并且冻干，获得4. 28g聚甘油醛MW 5,000, Eff 400，使用1H NMR (500MHz, D2O)将其表征。 The dialyzed solution was freeze tubing and lyophilized to obtain poly glyceraldehyde 4. 28g MW 5,000, Eff 400, using 1H NMR (500MHz, D2O) which was characterized. SEC-MALS[流动相PBS (IOmM 磷酸盐，2. 7mM KCl, 0. 137M NaCl，pH 7. 4), 0. 5mL/ min，两根TSKgel GMPWXL 混合床柱(T0S0H Bioscience LLC)，柱温30°C，dn/dc 0. 124mL/ g]，获得Mn 4，200，Mw 11，200，以及Mw/Mn 2. 6。  SEC-MALS [Mobile phase PBS (IOmM phosphate, 2. 7mM KCl, 0. 137M NaCl, pH 7. 4), 0. 5mL / min, two TSKgel GMPWXL mixed bed columns (T0S0H Bioscience LLC), a column temperature 30 ° C, dn / dc 0. 124mL / g], to obtain Mn 4,200, Mw 11,200, and Mw / Mn 2. 6. 该实施例的目的在于制备具有约5，OOODa平均分子量和约200Da每醛基当量的聚甘油醛。  The object of the embodiment is that prepared having about 5, OOODa average molecular weight from about 200Da aldehyde group per equivalent of aldehyde polyglycerol. 通过使用高碘酸钠氧化具有约5，OOODa平均分子量和约42%支化度的聚甘油，并且通过一系列沉淀纯化，来制备聚甘油醛。 By using sodium periodate oxidation of about 5, an average molecular weight of the polyglycerol OOODa degree of branching of about 42%, and by a series of precipitation purification to prepare poly glyceraldehyde. 采用由A. Sunder等人（“Macromolecules”，32 ： 4240-4246,1999)描述的13C NMR波谱方法，测定原料聚甘油5000的支化度。 Using the A. Sunder, et al. ( "Macromolecules", 32: 4240-4246,1999) 13C NMR spectroscopic methods described herein, determining the branching of the raw material polyglycerol 5000. 如实施例4中一样，将聚甘油5000完全氧化，获得具有约200Da每醛基当量的聚甘油醛。 The same as in Example 4, polyglycerol 5000 completely oxidized to give aldehydes having about 200Da polyglycerol equivalents per aldehyde group. 将50. OOg NaIO4的450mL水溶液加入到溶于150mL水的50. OOg聚甘油5000溶液中，足够缓慢以保持反应温度不升至30°C以上。  A 450mL aqueous solution 50. OOg NaIO4 dissolved in 150mL of water was added to the polyglycerol 50. OOg 5000 was slowly enough to maintain the reaction temperature did not rise above 30 ° C. 加料完成后，将混合物在环境温度下搅拌1 小时。 After the addition was complete, the mixture was stirred at ambient temperature for 1 hour. 加入乙二醇（3mL)淬灭过量的高碘酸盐。 Ethylene glycol (3mL) quench excess periodate. 将混合物在环境温度下搅拌半小时，用2L 异丙醇稀释，并且过滤移除沉淀出的盐。 The mixture was stirred at ambient temperature for half an hour, diluted with 2L of isopropyl alcohol and filtered to remove precipitated salts. 通过减压蒸发，将混合物浓缩至约200mL。 By evaporation under reduced pressure, the mixture was concentrated to about 200mL. 根据上述Belcher等人的方法，对所得混合物等分试样滴定残余的碘酸盐和高碘酸盐，表明产物中仍存在3. IOmmol的碘酸盐和0. 135mmol的高碘酸盐。 Belcher et al., According to the above method, an aliquot of the resulting mixture of residual iodate titration and periodate salts, the product still showed presence of 3. IOmmol 0. 135mmol iodate and periodate. 将二水合氯化钙（0. 458g，3. 12mmol)和500mL异丙醇加入到混合物中，然后将其过滤通过20g (2. 5 X 0. 875英寸垫）Celite®妨4硅藻土（World Minerals，Lompoc，CA)。 The calcium chloride dihydrate (0. 458g, 3. 12mmol) and 500mL isopropanol was added to the mixture, which was then filtered through a 20g (2. 5 X 0. 875 inch pad) Celite® diatomaceous earth hinder 4 ( world Minerals, Lompoc, CA). 将混合物减压蒸发浓缩，使用额外的水以确保移除异丙醇，并且将所得水溶液冻干，获得46.½聚甘油醛MW 5, 000,Eff 200，采用1H NMR(500MHz, D2O)将其表征。 The mixture was concentrated by evaporation under reduced pressure, using additional water to ensure removal of isopropanol, and the resulting aqueous solution was lyophilized to obtain poly 46.½ glyceraldehyde MW 5, 000, Eff 200, using 1H NMR (500MHz, D2O) the its characterization. SEC-MALS[流动相PBS (IOmM 磷酸盐，2. 7mM KCl, 0. 137M NaCl，pH 7. 4), 0. 5mL/ min，两根TSKgel GMPWXL 混合床柱(T0S0H Bioscience LLC)，柱温30°C，dn/dc 0. 124mL/ g]获得Mn 2，460，Mw 8，580，以及Mw/Mn 3. 5。  SEC-MALS [Mobile phase PBS (IOmM phosphate, 2. 7mM KCl, 0. 137M NaCl, pH 7. 4), 0. 5mL / min, two TSKgel GMPWXL mixed bed columns (T0S0H Bioscience LLC), a column temperature 30 ° C, dn / dc 0. 124mL / g] obtained Mn 2,460, Mw 8,580, and Mw / Mn 3. 5. 该实施例的目的在于制备具有约10，OOODa平均分子量和约200Da每醛基当量的聚甘油醛。  The object of embodiments is to produce about 10, OOODa average molecular weight from about 200Da aldehyde group per equivalent of aldehyde polyglycerol. 通过使用高碘酸钠氧化具有约10，OOODa平均分子量和约62%支化度的聚甘油来制备聚甘油醛。 By using sodium periodate oxidation of about 10, OOODa average molecular weight of from about 62% degree of branching polyglycerol poly-glyceraldehyde was prepared. 由如上所述的原料聚甘油10，000的数均分子量（Mn)和其每末端二醇部分当量，计算其支化度。 Polyglycerol described above starting materials by 10,000 number average molecular weight (Mn) and each of the end portions diol equivalents, calculated degree of branching. 将45. 37g NaIO4的400mL水溶液加入到溶于120mL水的40. 37g聚甘油10，000溶液中，足够缓慢以保持反应温度不升至30°C以上。  A 400mL aqueous solution of 45. 37g NaIO4 dissolved in 120mL of water was added to 40. 37g of polyglycerol 10,000 was slowly enough to maintain the reaction temperature did not rise above 30 ° C. 加料完成后，将混合物在环境温度下搅拌1小时。 After the addition was complete, the mixture was stirred at ambient temperature for 1 hour. 根据上述Belcher等人的方法，对反应混合物等分试样滴定碘酸盐和残余的高碘酸盐，表明82.8%的高碘酸盐已被消耗，并且转化成碘酸盐。 Belcher et al., According to the above method, an aliquot of the reaction mixture and iodate titration of the residual periodate, showed 82.8% of the periodate has been consumed and converted to iodide. 加入乙二醇（3mL)淬灭过量的高碘酸盐。 Ethylene glycol (3mL) quench excess periodate. 将混合物在环境温度下搅拌半小时，用2L异丙醇稀释，并且过滤移除沉淀出的盐。 The mixture was stirred at ambient temperature for half an hour, diluted with 2L of isopropyl alcohol and filtered to remove precipitated salts. 通过减压蒸发，将混合物浓缩至约230mL。 By evaporation under reduced pressure, the mixture was concentrated to about 230mL. 根据上述Belcher等人的方法，对所得混合物等分试样滴定残余的碘酸盐和高碘酸盐，表明产物中仍存在1. 89mmol的碘酸盐和0. OOOmmol 的高碘酸盐。 Belcher et al., According to the above method, an aliquot of the resulting mixture of residual iodate titration and periodate salts, the product still showed presence of iodate and 0. OOOmmol 1. 89mmol periodate. 将二水合氯化钙（0. 279g，1. 90mmol)和700mL异丙醇加入到混合物中，然后将其过滤通过20g(2. 5X0. 875英寸垫）Celite硅藻土。 The calcium chloride dihydrate (0. 279g, 1. 90mmol) and 700mL isopropanol was added to the mixture, which was then filtered through a 20g (2. 5X0. 875 inch pad) of Celite diatomaceous earth. 将混合物减压蒸发浓缩，使用额外的水以确保移除异丙醇，并且将所得水溶液冻干，获得35. Sg聚甘油醛MW 10，000，Eff 200，采用1H NMR (500MHz, D2O)将其表征。 The mixture was concentrated by evaporation under reduced pressure, using additional water to ensure removal of isopropanol, and the resulting aqueous solution was lyophilized to give the aldehyde 35. Sg polyglycerol MW 10,000, Eff 200, using 1H NMR (500MHz, D2O) the its characterization. SEC-MALS[流动相PBS (IOmM 磷酸盐，2. 7mM KCl, 0. 137M NaCl，pH 7. 4), 0. 5mL/ min，两根TSKgel GMPWXL 混合床柱(T0S0H Bioscience LLC)，柱温30°C，dn/dc 0. 124mL/ g]获得Mn 4，610，Mw 8，510，以及Mw/Mn 2. 1。  SEC-MALS [Mobile phase PBS (IOmM phosphate, 2. 7mM KCl, 0. 137M NaCl, pH 7. 4), 0. 5mL / min, two TSKgel GMPWXL mixed bed columns (T0S0H Bioscience LLC), a column temperature 30 ° C, dn / dc 0. 124mL / g] obtained Mn 4,610, Mw 8,510, and Mw / Mn 2. 1. 该实施例的目的在于制备具有约10，OOODa平均分子量和约400Da每醛基当量的聚甘油醛。  The object of embodiments is to produce about 10, OOODa average molecular weight from about 400Da aldehyde group per equivalent of aldehyde polyglycerol. 通过使用高碘酸钠氧化具有约10，OOODa平均分子量和约62%支化度的聚甘油来制备聚甘油醛。 By using sodium periodate oxidation of about 10, OOODa average molecular weight of from about 62% degree of branching polyglycerol poly-glyceraldehyde was prepared. 由如上所述的原料聚甘油10，000的数均分子量（Mn)和其每末端二醇部分当量，计算其支化度。 Polyglycerol described above starting materials by 10,000 number average molecular weight (Mn) and each of the end portions diol equivalents, calculated degree of branching. 将21. 39g NaIO4的200mL水溶液加入到溶于120mL水的39. 48g聚甘油10，000 溶液中，足够缓慢以保持反应温度不升至30°C以上。  A 200mL aqueous solution of 21. 39g NaIO4 dissolved in 120mL of water was added to 39. 48g of polyglycerol 10,000 was slowly enough to maintain the reaction temperature did not rise above 30 ° C. 加料完成后，将混合物在环境温度下搅拌1小时。 After the addition was complete, the mixture was stirred at ambient temperature for 1 hour. 加入异丙醇OL)，并且将混合物过滤以去除沉淀出的盐。 Isopropanol OL), and the mixture was filtered to remove precipitated salts. 通过减压蒸发，将混合物浓缩至约200mL。 By evaporation under reduced pressure, the mixture was concentrated to about 200mL. 根据上述Belcher等人的方法，对所得混合物等分试样滴定残余的碘酸盐和高碘酸盐，表明产物中仍存在0. 329mmol的碘酸盐和0. OOOmmol的高碘酸盐。 Belcher et al., According to the above method, an aliquot of the resulting mixture of residual iodate titration and periodate salts, the product still showed presence of 0. 329mmol iodate and periodate 0. OOOmmol. 将二水合氯化钙（0. 050g，0. 34mmol)和500mL异丙醇加入到混合物中，然后将其过滤通过20g(2. 5X0. 875英寸垫）Celite硅藻土。 The calcium chloride dihydrate (0. 050g, 0. 34mmol) and 500mL isopropanol was added to the mixture, which was then filtered through a 20g (2. 5X0. 875 inch pad) of Celite diatomaceous earth. 将混合物减压蒸发浓缩，使用额外的水以确保移除异丙醇，并且将所得水溶液冻干，获得17. 4g聚甘油醛MW 10, 000,Eff 400，采用ΐ NMR (500MHz, D2O)将其表征。 The mixture was concentrated by evaporation under reduced pressure, using additional water to ensure removal of isopropanol, and the resulting aqueous solution was lyophilized to give 17. 4g of poly glyceraldehyde MW 10, 000, Eff 400, using ΐ NMR (500MHz, D2O) the its characterization. SEC-MALS[流动相PBS (IOmM 磷酸盐，2. 7mM KCl, 0. 137M NaCl，pH 7. 4), 0. 5mL/ min，两根TSKgel GMPWXL 混合床柱(T0S0H Bioscience)，柱温30°C，dn/dc 0.124mL/g]，获得Mn 3，590，Mw 5，440，以及Mw/Mn 1. 5。  SEC-MALS [Mobile phase PBS (IOmM phosphate, 2. 7mM KCl, 0. 137M NaCl, pH 7. 4), 0. 5mL / min, two TSKgel GMPWXL mixed bed columns (T0S0H Bioscience), column temperature 30 ° C, dn / dc 0.124mL / g], to obtain Mn 3,590, Mw 5,440, and Mw / Mn 1. 5. 这些实施例的目的在于比较聚甘油醛棚5，000，Eff 200与葡聚糖醛D10-50储存于水溶液中时的稳定性。  These objects is to Comparative Example polyglycerol aldehyde shed 5,000, Eff 200 and dextran aldehyde D10-50 stability when stored in aqueous solution. 23溶液中老化12天前后的Mw分别为9，300和9，600，同样表明储存在水溶液中时，PGA-5-200 是稳定的。 23 days before or after the solution for 12 Mw of 9,300 and 9,600, respectively, also showed that when stored in an aqueous solution, PGA-5-200 is stable. 这些实施例的目的在于比较聚甘油醛棚5，000，Eff 200与葡聚糖醛D10-50储存于水溶液中时的分子量稳定性。  These objects is to Comparative Example polyglycerol aldehyde shed 5,000, Eff 200 and a molecular weight dextran aldehyde D10-50 storage stability in aqueous solution. 由SEC-MALS测定重均分子量（Mw)。 SEC-MALS determined by the weight-average molecular weight (Mw). 将如实施例4所述制得的聚甘油醛丽5000，Eff 200 (PGA-5-200)(实施例11)和如试剂中所述制得的葡聚糖醛D10-50(实施例12，对照物）的水溶液（25wt%固体）在40°C 下培养，并且由SEC-MALS[流动相PBS (IOmM 磷酸盐，2. 7mM KCl, 0. 137M NaCl，pH 7.4)， 0. 5mL/min,串联的TSKgel G5000PWXL 和G3000PWXL (T0S0H Bioscience,每种一根)，柱温35°C, dn/dc 0. 124mL/g]定期测定重均分子量（Mw)。  4 prepared as described in the polyglycerol aldehyde Korea embodiment 5000, Eff 200 (PGA-5-200) (Example 11) and as a reagent in the resulting dextran aldehyde D10-50 ( aqueous solution (25wt% solids) of Example 12, control) implemented at 40 ° C for culture, and by the SEC-MALS [Mobile phase PBS (IOmM phosphate, 2. 7mM KCl, 0. 137M NaCl, pH 7.4), 0 . 5mL / min, a series of TSKgel G5000PWXL and G3000PWXL (T0S0H Bioscience, each one), the column temperature was 35 ° C, dn / dc 0. 124mL / g] weight average molecular weight measured periodically (Mw). 结果总结于表2中。 The results are summarized in Table 2. PGA-5-200显示40°C下加速老化后无Mw损失，而D10-50显示40°C下加速老化7天后Mw降低11 %。 PGA-5-200 show Mw 40 ° C for no loss after accelerated aging, and the display D10-50 40 ° C for 7 days of accelerated aging Mw decreased by 11%. *nd是指未测定。  * nd means not determined. 该实施例的目的在于展示经由聚甘油醛和多臂PEG胺的反应形成水凝胶。  The object of the embodiment is to show formation of a hydrogel by reaction of poly glyceraldehyde and multi-arm PEG amine. 使如实施例2所述制得的25衬％聚甘油醛MW 1，000的水溶液（100 μ L)与100 μ L 50wt%如试剂中所述制得的八臂PEG IOK八胺P8-10-1的水溶液搅拌在一起。  The aqueous solution as described in Example 2 was 25% polyethylene liner of glyceraldehyde MW 1,000 (100 μ L) and 100 μ L 50wt% as the reagent prepared in the eight-arm PEG IOK Octaamine P8-10-1 stirring together an aqueous solution. 六次平行测定的胶凝时间测量结果（即平均偏差和标准偏差）示于表3中。 Gel time measurement of six replicates (i.e., the mean and standard deviation) are shown in Table 3. 表3中的结果表明，通过聚甘油醛MW 1，000与多臂PEG胺P8-10-1的反应，水凝胶在短时间内形成。  The results in Table 3 show that the hydrogel is formed by polymerization in a short time and glyceraldehyde multi-arm PEG amine MW 1,000 P8-10-1 reaction. 这些实施例的目的在于展示经由聚甘油醛和多臂PEG胺的反应形成水凝胶。  These examples show that the formation of a hydrogel by reaction of poly glyceraldehyde and multi-arm PEG amine. 由振荡盘流变测定法测定水凝胶的形成。 Hydrogel-forming measured by the oscillating disk rheometry. 由5mL 双管注射器（Mixpac SDL X05-01-50M，具有压杆部件PLH X05-01-45M 和PPD X05-01-02SM)，通过12 梯级静态混合管尖(Mixpac ML 2. 5-12-SM)，将约1. 6mL 如实施例4中所述制得的聚甘油醛丽5，000，EW 200(PGA-5-200)的水溶液和约1.6mL如试剂中所述制得的包含八臂PEG八胺P8-10-1的水溶液榨到APA2000型流变仪（AlphaTechnologies,Akron,0H)的样品台上。  5mL a double syringe (Mixpac SDL X05-01-50M, and having a lever member PLH X05-01-45M PPD X05-01-02SM), step 12 through a static mixing tube tip (Mixpac ML 2. 5- 12-SM), approximately 1. 6mL as described in Example 4 to obtain an aldehyde polyglycerol Korea 5,000, EW 200 (PGA-5-200), and about 1.6mL of aqueous reagent as prepared in the an aqueous solution comprising the eight-arm PEG octaamine P8-10-1 squeezed to APA2000 rheometer (AlphaTechnologies, Akron, 0H) sample stage. 将两个样品台放在一起，并且每隔约2秒测定储能模量（G')，共测定3分钟。 The two sample stage together, and determining the storage modulus (G ') at intervals of about 2 seconds, 3 minutes were measured. 取21秒处的G'值作为胶凝速率的量度。 Taking 21 seconds at a value of G 'as a measure of the rate of gelation. 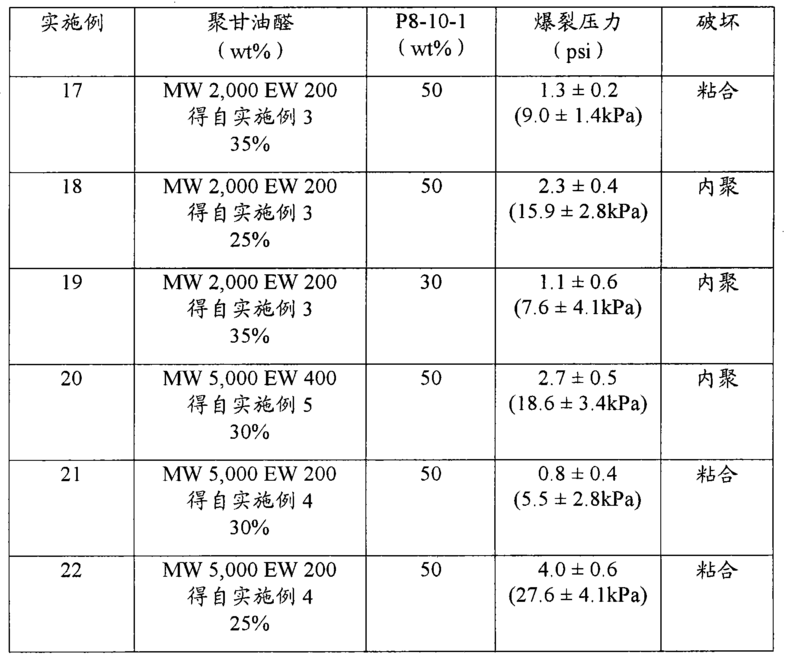 结果示于表4中。 The results are shown in Table 4. 可通过调节聚甘油醛和多臂PEG胺的浓度和比例，形成具有可接受机械特性范围的水凝胶。 By adjusting the concentration and ratio of polyglycerol and multi-arm PEG aldehyde amine, to form a hydrogel having acceptable mechanical properties ranges. 这些实施例的目的在于展示使用由聚甘油醛和多臂PEG胺形成的水凝胶闭合猪子宫角切口的破裂强度。  These examples show that the use of hydrogels formed from polyethylene multi-arm PEG amine and glyceraldehyde closed fracture strength swine uterine horn incision. 将如实施例3至5所述制得的聚甘油醛水溶液分别载入到如实施例14-16中所示的双管注射器的一端，并且将如试剂中所述制得的30或50wt%多臂PEG八胺P8-10-1的水溶液载入到另一端中。  as described in the polyglycerol aqueous aldehyde solution prepared in Example 3-5 were loaded into an end of the double syringe as illustrated in Examples 14-16, and the reagent prepared in the 30 an aqueous solution of 50wt% or multi-arm PEG octaamine P8-10-1 loaded into the other end. 将12梯级静态混合管尖（Mixpac ML 2. 5-12-LM)连接到每个注射器的喷嘴上。 The static mixing step 12 the tip (Mixpac ML 2. 5-12-LM) connected to each injector nozzle. 将得自当地屠宰场的新鲜猪子宫角切成2至3英寸（5至7. 5cm)片段，并且用剪刀横切管腔，切出Icm切口。 Fresh porcine uterine horn  obtained from a local slaughterhouse was cut into 2 to 3 inches (5 to 7. 5cm) fragment, and a lumen cross-section with scissors, cut Icm incision. 使用具有混合管尖的双管注射器将如上所述的两种水溶液的混合物施加到切口上，并且使其固化1. 0-1. 5分钟。 Using the double syringe having the tip of mixing two aqueous solutions in the mixture as described above is applied to the incision and allowed to cure 1. 0-1. 5 min. 然后使子宫角段的一端连接到管材上， 所述管材连接具有压力计的注射器泵。 One end section of the uterine horn is then connected to the tubing, the tubing connected to a syringe pump having a pressure gauge. 将子宫角段的另一端夹紧闭合，浸没于水中，并且以10mL/min的速率将染成紫色的水泵送通过所述子宫角段。 The other end of the grip closure uterine horn section, immersed in water, and at a rate of 10mL / min will be dyed purple water pumping through the uterine horn section. 记录封口破裂时的压力和破坏形式（内聚破坏对粘合破坏）。 And recording the pressure when the seal break failure mode (cohesive failure to adhesive failure). 以平均偏差和标准偏差形式示出的结果总结于表5中。 The results are shown in the form of the mean and standard deviation are summarized in Table 5. 为进行比较，使用氧化葡聚糖替代聚甘油醛，如上所述进行爆裂压力测量。  For comparison, using oxidized dextran replace polyethylene glyceraldehyde, a burst pressure measured as described above. 具体地讲，使用包含D10-20或D10-50 (如试剂中所述制得）的水溶液与包含P8-10-1 PEG胺的水溶液的组合，闭合猪子宫角中的切口。 In particular, use of a combination comprising an aqueous solution or an aqueous solution D10-20 D10-50 (prepared as described in the reagent) with P8-10-1 PEG comprising an amine, closing an incision in the pig uterine horn. 结果示于表6中。 The results are shown in Table 6. 表5中的结果表明，由聚甘油醛和多臂PEG胺形成的水凝胶粘合剂表现出足以用于组织粘合剂、密封剂和其它体内应用的破裂强度。 Results  Table 5 shows that the hydrogel adhesive is formed of poly glyceraldehyde and multi-arm PEG amine is sufficient for the burst strength exhibited tissue adhesives, sealants, and other in vivo applications. 将表5中示出的结果与表6中示出的结果进行比较表明，当与水分散性多臂聚醚胺组合时，聚甘油醛形成组织粘合剂，其粘附强度类似或大于用氧化多糖制得的比较制剂（比较实施例23和24)的粘附强度。 The results are shown in Table 6 in 5 shows the results of the comparison table shows that when the water-dispersible multi-arm polyether amine composition, polyethylene glyceraldehyde form a tissue adhesive which is similar to or greater than the adhesive strength with oxidized polysaccharide resulting comparative formulation (Comparative Examples 23 and 24) the adhesive strength. 该实施例的目的在于展示由聚甘油醛和多臂PEG胺形成的水凝胶在体外细胞毒性测试中的安全性。  The object of the embodiment is to show the safety of the hydrogel in vitro cytotoxicity test polyglycerol formed by the multi-arm PEG amine and an aldehyde. 将如实施例14-16中所述的5-mL双管注射器和压杆部件、和12梯级静态混合管尖（Mixpac ML 2. 5-12-LM)密封于保护袋中，并且通过高压灭菌消毒。  As will be described in the embodiments 14-16 5-mL double syringe and plunger member, and the tip 12 static mixing step (Mixpac ML 2. 5-12-LM) sealed in protective bag, and sterilized by autoclaving. 将如实施例4所述制得的25衬％聚甘油醛MW 5, 000,Eff 200 (PGA-5-200)的水溶液和如试剂中所述制得的20 和30wt% 8臂PEG IOK八胺P8-10-1的水溶液无菌过滤（0. 2 μ m)，然后在无菌室内处理。 As described in the substrate 4 was 25% polyethylene glyceraldehyde MW 5 Example 000, an aqueous solution Eff 200 (PGA-5-200) and was prepared as the reagent 20 and 30wt% 8 arm PEG IOK eight sterile aqueous amine P8-10-1 filtered (0. 2 μ m), and then treated in a sterile chamber. 将聚甘油醛溶液载入到双管注射器的一端，并且将20或30wt %的P8-10-1溶液载入到另一端。 Polyglycerol aldehyde solution loaded onto one end of the double-barreled syringe, and 20 or 30wt% solution of P8-10-1 loaded into the other end. 将12梯级静态混合管尖连接到每个注射器的喷嘴上。 The static mixing step the tip 12 connected to each injector nozzle. 从每个双管注射器中，经由静态混合管尖将粘合剂水凝胶平条挤出到无菌聚苯乙烯培养皿的凹孔中。  From each of the double-barreled syringe, static mixing tube tip via the adhesive hydrogel to the planar strip extruded polystyrene recesses sterile culture dish. 采用无菌工艺，将30mg每种水凝胶样品转移到35mm直径的无菌聚苯乙烯培养皿的凹孔中，并且用补充有10%胎牛血清的2mL Dulbecco改性必需培养基（DMEM) 覆盖。 Recesses sterile polystyrene petri dish using aseptic processing, 30mg of each hydrogel transferred to 35mm diameter samples, and supplemented with 10% fetal bovine serum Dulbecco's modified essential medium 2 mL (DMEM) cover. 然后将凹孔接种ImL(50，000至100，000个细胞）得自American Type Culrure Collection(ATCC ；Manassas, VA)并且在补充有10%胎牛血清的DMEM中生长的NIH3T3小鼠成纤维细胞过夜培养物。 The recess is then seeded ImL (50,000 to 100,000 cells) were obtained from American Type Culrure Collection (ATCC; Manassas, VA) and 10% have NIH3T3 mouse grown in DMEM supplemented with fibroblasts overnight culture. 在37°C下培养M和48小时后，对细胞进行细胞变圆（表明死亡）、铺满覆盖凹孔底部、生长至水凝胶边缘、和生长超过水凝胶（表明细胞培养物对水凝胶的粘附）的检测。 After incubation at 37 ° C M and 48 hours, the cells were round cells (indicating death), covering the bottom of the recess covered with holes, the edges of the hydrogel to grow, and grow beyond a hydrogel (water indicates that the cell culture adhesive gel) detection. 将测试平行测定三次。 The test replicates three times. 不存在水凝胶下培养的细胞用作细胞存活度的阳性对照，而根据ISO 10993-5 :1999在IcmXlcm PVC(聚氯乙烯）条存在下培养的细胞用作细胞存活度的阴性对照。 The positive control cells cultured in the hydrogels as the absence of cell viability, according to ISO 10993-5: cells cultured in the presence of cell viability as a negative control in IcmXlcm PVC (polyvinyl chloride) of 1999. 根据该检测分析法，由25wt%聚甘油醛与20wt% PEG胺溶液以及由25wt%聚甘油醛和30wt% PEG胺溶液形成的水凝胶均未显示出对NIH3T3小鼠成纤维细胞的细胞毒性迹象。 According to this assay, a polyglycerol 25wt% 20wt% PEG aldehyde to the amine solution and the hydrogel formed from polyglycerol 25wt% 30wt% PEG aldehyde and amine solution did not show on NIH3T3 mouse fibroblasts cytotoxicity sign. 细胞形成铺满的单层，与延伸至水凝胶样品但没有长得超过水凝胶样品的阳性对照相当。 Cell confluent monolayer is formed, extending to the positive control samples without the hydrogel grows rather than a hydrogel sample. 这些结果表明，由聚甘油醛和多臂PEG胺形成的水凝胶可安全用于体内。 These results indicate that the hydrogel formed from an aldehyde and polyglycerol safe multi-arm PEG amine may be used in vivo. 这些实施例的目的在于展示由聚甘油醛和多臂PEG胺形成的水凝胶在体外降解测试中随时间推移的降解度。  These examples show that the degree of degradation of the hydrogel formed from polyglycerol multi-arm PEG amine and aldehyde in vitro degradation test over time. 使如实施例14-16中所示的5mL双管注射器的一管装有如实施例4所述制得的20 或25wt%的聚甘油醛MW 5, OOOjEW 200溶液。  Example 5mL so as double syringe shown with a 14-16 as described in Example 4 was 20 or 25wt% of polyethylene glyceraldehyde MW 5, 200 solution OOOjEW. 另一管装有25wt%的5 ： l(w/w)的如试剂中所述制得的8臂PEG IOK八胺P8-10-1和如试剂中所述制得的8臂PEG IOK十六胺P8-10-2 的溶液。 5 of another tube containing 25wt%: l (w / w) as prepared in Reagent 8-arm PEG IOK octaamine P8-10-1 and the reagent prepared as in 8-arm PEG IOK ten P8-10-2 solution of hexamine. 将12梯级静态混合管尖（Mirfac ML 2. 5-12-SM)连接到每个注射器上。 The static mixing step 12 the tip (Mirfac ML 2. 5-12-SM) connected to each syringe. 从每个双管注射器中，经由混合管尖将水凝胶挤到Teflon®模具中，以形成约30mmX 7mmX Imm的条带。 From each of the double-barreled syringe, the tip of the mixing tube via the hydrogel pushed Teflon® mold to form a strip of about 30mmX 7mmX Imm. 使每个条带固化15分钟，之后从模具中取出。 Each strip cured for 15 minutes and then removed from the mold. 将每个测试条带单独放入到预先润湿的配衡的不锈钢筛（#400)杯中，并且将筛杯和样品称重，放入到20mL闪烁小瓶中，并且用约ISmL的Dulbecco磷酸盐缓冲盐溶液（DPBQ覆盖。使分别包含测试条带和筛杯的盖封小瓶在37°C下培养，并且在定轨摇床中以105rpm速率摇动。定期将每个具有测试条带的筛杯从其小瓶中取出，用纸巾拍干，称重，放回至其小瓶中，并且用约18mL新鲜的DPBS覆盖。然后将每个小瓶盖封，并且放回至定轨摇床中。将每种制剂测试条带进行两次平行测定。将每个时点处记录的两次平行测定的测试条带质量取平均，并且将结果总结于表7中。 这些实施例示出，由聚甘油醛和多臂PEG胺制得的水凝胶在含水环境中保持若干天，但是随时间推移而降解。 Each test strip was placed individually pre-wetted tared stainless steel screen (# 400) of the cup, and the cup and the sample screen was weighed, placed in a 20mL scintillation vial, and Dulbecco's phosphate with about ISmL buffered saline solution (DPBQ covered so that each test strip comprising a cup and a screen cover seal vials incubated at 37 ° C, and shaken at a rate of 105rpm on an orbital shaker. periodically each sieve having a test strip remove the vial from the cup, patted dry with a paper towel, weighed, placed back into its vial and covered with about 18mL of fresh DPBS. each vial was then sealed and returned to the orbital shaker. each test formulation was measured two parallel strips. two replicates at each time point recorded test strip quality averaged, and the results are summarized in table 7.  these embodiments shown, poly glyceraldehyde and multi-arm PEG amine prepared hydrogel held for several days in aqueous environments, but degrade over time. 搬,鹏胴謹隨口口口M ( _■姬佩”  conveyed, Peng casually wish mouth barrel M (_ ■ Ji Pei "
 a质量（原质量的百分比)是两次平行测定的平均值。  a mass (percentage of original mass) is the average of two replicates. 13与PEG胺合并之前，聚甘油醛丽5，000，EW 200在溶液中的wt%。  13 combined with the previous PEG amine, poly glyceraldehyde Korea 5,000, EW 200 wt% in solution. 通过将聚甘油酸MW5，000，EW 200 溶液与 5 ： 1 (w/w)P8-10-1 ： P8-10-2 的溶液混合，形成每种水凝胶。 200 by the acid solution polyglycerol MW5,000, EW and 5: 1 (w / w) P8-10-1: P8-10-2 the mixed solution, each forming a hydrogel. 1.试剂盒，所述试剂盒包含：a)至少一种具有醛基的聚甘油醛，所述聚甘油醛具有约400至约20，000道尔顿的数均分子量，和约100至约3，000道尔顿的每醛基当量；和b)至少一种水分散性多臂胺，其中至少三个所述臂被至少一个伯胺基封端，其中所述多臂胺具有约450至约200，000道尔顿的数均分子量。 1. A kit, said kit comprising: a) at least one aldehyde group of an aldehyde having a polyglycerol, a polyglycerol aldehyde has a number from about 400 to about 20,000 Daltons, from about 3 to about 100 , 000 daltons per equivalent of aldehyde group; and b) at least one water-dispersible multi-arm amine, wherein at least three arms of at least one primary amine group is blocked, wherein the multi-arm amine having about 450 to about 200,000 Daltons number average molecular weight. 2.根据权利要求1的试剂盒，其中所述聚甘油醛被包含在第一水溶液或分散体中，并且所述水分散性多臂胺被包含在第二水溶液或分散体中。 The kit of claim 1, wherein the polyglycerol aldehyde contained in the first aqueous solution or dispersion, and the water-dispersible multi-arm amine contained in the second aqueous solution or dispersion. 3.根据权利要求2的试剂盒，其中所述第一水溶液或分散体包含所述聚甘油醛，所述聚甘油醛的浓度相对于所述溶液或分散体的总重量为约5重量％至约40重量％。 A kit according to claim 2, wherein the first aqueous solution or dispersion containing the poly glyceraldehyde, glyceraldehyde concentration of the polyethylene relative to the total weight of the dispersion or solution is from about 5 wt% to about 40% by weight. 4.根据权利要求2的试剂盒，其中所述第二水溶液或分散体包含所述水分散性多臂胺，所述水分散性多臂胺的浓度相对于所述溶液或分散体的总重量为约5重量％至约70重量％。 A kit according to claim 2, wherein the second aqueous solution or dispersion comprising the water-dispersible multi-arm amine concentration of the water-dispersible multi-arm amine relative to the total weight of the dispersion or solution of from about 5 wt% to about 70 wt%. 其中：A为（a)通过从包含1至20个碳原子和1至8个羟基的醇或多元醇上移除-或多个羟基而衍生的烃基，或（b)通过从（i)包含1至20个碳原子和1至8个羟基的醇或多元醇与（ii) 一种或多种环状醚的反应产物上移除一个或多个羟基而衍生的氧杂烃基或多氧杂烃基，其中所述反应产物的Mn小于或等于5，OOODa ；R1为氢原子、1至8碳烃基、 R2-0-[R3-CH0]p、或R3-CHO ；R2为包含1至270个经由醚键连接的甘油单元的聚合链段；R3为包含1至8个碳原子的亚烃基；η = 1至8 ;m · η = 3至170 ；并且ρ = 1至40。 Wherein: A is (a) by removing from 1 to 20 carbon atoms and 1 to 8 hydroxyl groups on alcohol or polyol - or more hydroxyl groups derived hydrocarbon group, or (b) by the (i) comprises removing 1 to 20 carbon atoms and 1 to 8 hydroxyl groups or polyol and (ii) one or more reaction products of cyclic ethers with one or more hydroxyl groups derived oxa or oxaalkyl hydrocarbyl, Mn wherein said reaction product is less than or equal to 5, OOODa; R1 is a hydrogen atom, a hydrocarbon group of 1 to 8 carbons, R2-0- [R3-CH0] p, or R3-CHO; R2 comprising 1-270 via a polymeric segment glycerol units ether linkage; R3 is a hydrocarbylene group containing from 1 to 8 carbon atoms; η = 1 to 8; m · η = 3 to 170.; and ρ = 1 to 40. 6.根据权利要求5的试剂盒，其中所述环状醚选自环氧乙烷、甲基环氧乙烷、氧杂环丁烷和氧杂环戊烷。 6. The kit of claim 5, wherein said cyclic ether selected from ethylene oxide, methyl oxirane, oxetane and oxolane. 7.根据权利要求5的试剂盒，其中在所述通式中，A为通过从三羟甲基丙烷上移除J羟基衍生的CH3CH2C(CH2-)3 ；R2为由1至60个经由醚键连接的甘油单元构成的聚合链段；R3 为-CH2- ；R1 为氢原子、R2-O-[R3-CHO]ρ、或R3-CHO ；m = 1 至30 ;n = 3 ；并且ρ = 1 至30。 CH3CH2C (CH2-) 7. The kit of claim 5, wherein in the general formula, A is derived by removing a hydroxyl group from the J trimethylol propane 3; R2 via by 1-60 ether polymeric segment glycerol units composed of bonds; R3 is -CH2-; R1 is a hydrogen atom, R2-O- [R3-CHO] ρ, or R3-CHO; m = 1 to 30; n = 3; and [rho] = 1-30. 8.根据权利要求1的试剂盒，其中所述聚甘油醛具有约10%至约99. 9%的支化度。 8. The kit of claim 1, wherein the polyglycerol aldehyde having from about 10% to about 99.9% of the degree of branching. 9.根据权利要求1的试剂盒，其中所述水分散性多臂胺选自水分散性多臂聚醚胺、氨基封端的树枝状聚酰氨基胺、和末端支化的多臂胺。 9. The kit of claim 1, wherein the amine is selected from water-dispersible multi-arm water-dispersible multi-arm polyether amines, amino-terminated dendritic polyamidoamines, and a branched multi-arm amine end. 10.根据权利要求9的试剂盒，其中所述水分散性多臂胺为水分散性多臂聚醚胺。 10. The kit of claim 9, wherein the amine is a water-dispersible multi-arm water-dispersible multi-arm polyether amine. 11.根据权利要求10的试剂盒，其中所述水分散性多臂聚醚胺选自氨基封端的星形聚环氧乙烷、氨基封端的树枝状聚环氧乙烷、氨基封端的梳形聚环氧乙烷、氨基封端的星形聚环氧丙烷、氨基封端的树枝状聚环氧丙烷、氨基封端的梳形聚环氧丙烷、氨基封端的星形聚环氧乙烷-聚环氧丙烷共聚物、氨基封端的树枝状聚环氧乙烷-聚环氧丙烷共聚物、氨基封端的梳形聚环氧乙烷-聚环氧丙烷共聚物、和聚氧化烯三胺。 11. The kit of claim 10, wherein said water-dispersible multi-arm polyether amine is selected from dendritic comb polyethylene oxides, amino-terminated amino-terminated star polyethylene oxides, amino-terminated polyethylene oxides, amino-terminated star polypropylene oxides, amino-terminated dendritic polypropylene oxides, polypropylene oxide comb amino-terminated, amino-terminated star polyethylene oxide - polypropylene oxide oxide copolymers, amino-terminated dendritic polyethylene oxide - polypropylene oxide copolymers, amino-terminated comb polyethylene oxide - polypropylene oxide copolymers, and polyoxyalkylene triamines. 12.干燥水凝胶，所述干燥水凝胶由包括以下步骤的方法形成：a)在溶剂中合并（i)至少一种具有醛基的聚甘油醛，所述聚甘油醛具有约400至约20，000道尔顿的数均分子量，和约100至约3，000道尔顿的每醛基当量；和（ii)至少一种水分散性多臂胺，其中至少三个所述臂被至少一个伯胺基封端，所述多臂胺具有约450至约200，000道尔顿的数均分子量，以形成水凝胶；以及b)处理所述水凝胶以去除至少一部分所述溶剂，形成所述干燥水凝胶。 12. The hydrogel was dried, the dried hydrogel is formed by a method comprising the steps of: a) combined (i) in a solvent at least one aldehyde group of aldehyde polyglycerol, said polyglycerol having from about 400 to aldehyde about 20,000 Daltons number average molecular weight from about 100 to about 3,000 daltons per equivalent of aldehyde groups; and (ii) at least one water-dispersible multi-arm amine, wherein at least three arms are at least one primary amine terminated, the multi-arm amine has a number from about 450 to about 200,000 Daltons, to form a hydrogel; at least a portion, and b) treated to remove the hydrogel solvents, the dried hydrogel is formed. 13.根据权利要求12的干燥水凝胶，其中所述干燥水凝胶为膜形式。 13. The dried hydrogel according to claim 12, wherein the hydrogel is dried to form a film. 14.根据权利要求12的干燥水凝胶，其中所述方法进一步包括粉碎所述干燥水凝胶以形成细分颗粒的步骤。 14. The dried hydrogel according to claim 12, wherein the method further comprises the step of pulverizing the hydrogel is dried to form finely divided particles. 15.组合物，所述组合物包含以下物质的反应产物：a)至少一种具有醛基的聚甘油醛，所述聚甘油醛具有约400至约20，000道尔顿的数均分子量，和约100至约3，000道尔顿的每醛基当量；和b)至少一种水分散性多臂胺，其中至少三个所述臂被至少一个伯胺基封端，所述多臂胺具有约450至约200，000道尔顿的数均分子量。 15. The reaction product composition, said composition comprising the following substances: a) at least one aldehyde group in an aldehyde polyglycerol, the polyglycerol aldehyde having from about 400 to about 20,000 Daltons, per equivalent of aldehyde and from about 100 to about 3,000 daltons; and b) at least one water-dispersible multi-arm amine, wherein at least three arms are at least one primary amine terminated, the multi-arm amine having a number of about 450 to about 200,000 Daltons. 16.交联的水凝胶组合物，所述组合物包含：a)至少一种具有醛基的聚甘油醛，所述聚甘油醛具有约400至约20，000道尔顿的数均分子量，和约100至约3，000道尔顿的每醛基当量；以及b)至少一种水分散性多臂胺，其中至少三个所述臂被至少一个伯胺基封端，所述多臂胺具有约450至约200，000道尔顿的数均分子量；其中所述至少一种聚甘油醛和所述至少一种水分散性多臂胺通过在所述聚甘油醛的醛基与所述水分散性多臂胺的伯胺基之间形成的共价键交联。 16. A cross-linked hydrogel composition, said composition comprising: a) at least one aldehyde group of an aldehyde having a polyglycerol, a polyglycerol aldehyde has a number from about 400 to about 20,000 Daltons , from about 100 to about 3,000 daltons per equivalent of aldehyde group; and b) at least one water-dispersible multi-arm amine, wherein at least three arms are at least one primary amine terminated, the multi-arm amine having from about 450 to about 200,000 Daltons number average molecular weight; wherein the at least one polyglycerol aldehyde and at least one water-dispersible multi-arm amine by an aldehyde with the aldehyde of the polyglycerol covalent bond is formed between the primary amine groups crosslink said water-dispersible multi-arm of the amine. 18.根据权利要求17的交联水凝胶组合物，其中所述环状醚选自环氧乙烷、甲基环氧乙烷、氧杂环丁烷和氧杂环戊烷。 18. A cross-linked hydrogel composition according to claim 17, wherein said cyclic ether selected from ethylene oxide, methyl oxirane, oxetane and oxolane. 19.根据权利要求17的交联水凝胶组合物，其中在所述通式中，A为通过从三羟甲基丙烷上移除三个羟基衍生的CH3CH2C(CH2-)3 ；R2为由1至60个经由醚键连接的甘油单元构成的聚合链段；R3 为-CH2- ；R1 为氢原子、R2-O-[R3-CHO]ρ、或R3-CHO ；m = 1 至30 ;n = 3 ；并且ρ = 1 至30。 CH3CH2C (CH2-) 3 19. crosslinked hydrogel composition according to claim 17, wherein in the general formula, A is derived by removing the hydroxyl groups from the three trimethylol propane; R2 by polymeric segments 1-60 are connected via an ether bond composed of glycerol units; R3 is -CH2-; R1 is a hydrogen atom, R2-O- [R3-CHO] ρ, or R3-CHO; m = 1 to 30; n = 3; and ρ = 1 to 30. 20.根据权利要求16的交联水凝胶组合物，其中所述水分散性多臂胺选自水分散性多臂聚醚胺、氨基封端的树枝状聚酰氨基胺、和末端支化的多臂胺。 20. The crosslinked hydrogel composition of 16, wherein the amine is selected from water-dispersible multi-arm water-dispersible multi-arm polyether amines, amino-terminated dendritic polyamidoamines, and terminal branching claim dobby amine. 21.根据权利要求20的交联水凝胶组合物，其中所述水分散性多臂胺为水分散性多臂聚醚胺。 21. A cross-linked hydrogel composition according to claim 20, wherein said water-dispersible multi-arm amine is water-dispersible multi-arm polyether amine. 22.根据权利要求21的交联水凝胶组合物，其中所述水分散性多臂聚醚胺选自氨基封端的星形聚环氧乙烷、氨基封端的树枝状聚环氧乙烷、氨基封端的梳形聚环氧乙烷、氨基封端的星形聚环氧丙烷、氨基封端的树枝状聚环氧丙烷、氨基封端的梳形聚环氧丙烷、氨基封端的星形聚环氧乙烷-聚环氧丙烷共聚物、氨基封端的树枝状聚环氧乙烷-聚环氧丙烷共聚物、氨基封端的梳形聚环氧乙烷-聚环氧丙烷共聚物、和聚氧化烯三胺。 22. A cross-linked hydrogel composition according to claim 21, wherein said water-dispersible multi-arm polyether amine is selected from amino-terminated star polyethylene oxides, amino-terminated dendritic polyethylene oxides, comb polyethylene oxide amino terminated, amino-terminated star polypropylene oxides, amino-terminated dendritic polypropylene oxides, amino-terminated comb polypropylene oxides, amino-terminated star polyethylene oxide alkoxy - polypropylene oxide copolymers, amino-terminated dendritic polyethylene oxide - polypropylene oxide copolymers, amino-terminated comb polyethylene oxide - polypropylene oxide copolymers, and polyoxyalkylene three amine. 23.用于向活生物体组织上的解剖位点施用涂层的方法，所述方法包括：向所述位点施用a)至少一种具有醛基的聚甘油醛，所述聚甘油醛具有约400至约20，000道尔顿的数均分子量，和约100至约3，000道尔顿的每醛基当量；接着施用b)至少一种水分散性多臂胺，其中至少三个所述臂被至少一个伯胺基封端，所述多臂胺具有约450至约200，000道尔顿的数均分子量，或施用（b)，接着施用（a)，或将（a)和（b)预混，并且在所得混合物完全固化之前，将所得混合物施用到所述位点上。 23. A method for applying a coating to an anatomical site on tissue of a living organism, said method comprising: administering to the site a) at least one aldehyde group of an aldehyde having a polyglycerol, said polyglycerol having aldehyde from about 400 to about 20,000 Daltons number average molecular weight from about 100 to about 3,000 daltons per equivalent of aldehyde; followed by administration of b) at least one water-dispersible multi-arm amine, wherein at least three of the said arm is at least one primary amine terminated, the multi-arm amine having from about 450 to about 200,000 Daltons number average molecular weight, or administered (B), followed by administration of (a), or (a) and (b) pre-mixed and before the resultant mixture was completely cured, and the resulting mixture is applied to the site. 25.根据权利要求M的方法，其中所述环状醚选自环氧乙烷、甲基环氧乙烷、氧杂环丁烷和氧杂环戊烷。 25. The method of claim M, wherein said cyclic ether selected from ethylene oxide, methyl oxirane, oxetane and oxolane. 26.根据权利要求M的方法，其中在所述通式中，A为通过从三羟甲基丙烷上移除J羟基衍生的CH3CH2C(CH2-)3 ；R2为由1至60个经由醚键连接的甘油单元构成的聚合链段；R3 为-CH2- ；R1 为氢原子、R2-O-[R3-CHO]D、或R3-CHO ；m = 1 至30 ;n = 3 ；并且ρ = 1 至30。 26. The method of claim M, wherein in the general formula, A is derived by removing a hydroxyl group from the J trimethylolpropane CH3CH2C (CH2-) 3; R2 by 1-60 ether bonds via glycerol units constituting the polymeric segment connected; R3 is -CH2-; R1 is a hydrogen atom, R2-O- [R3-CHO] D, or R3-CHO; m = 1 to 30; n = 3; and ρ = 1-30. ES2275211T3 (en) 2003-02-26 2007-06-01 Shell Internationale Research Maatschappij B.V. Process for preparing polyether polyols. ES2369473T3 (en) 2011-12-01 Tissue adhesive based on polysaccharide polymer for medical use.